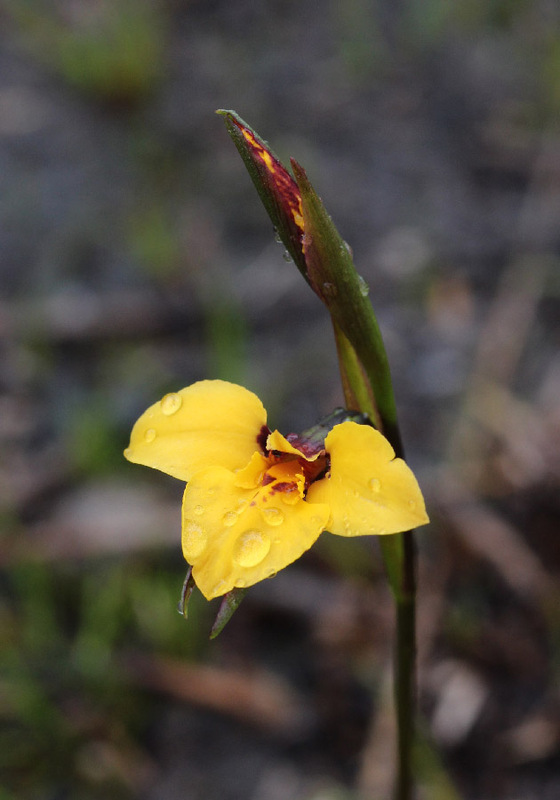 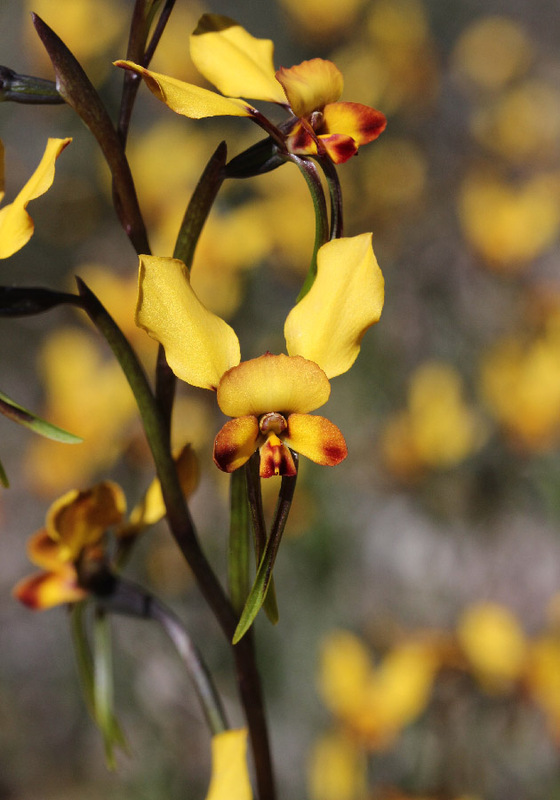 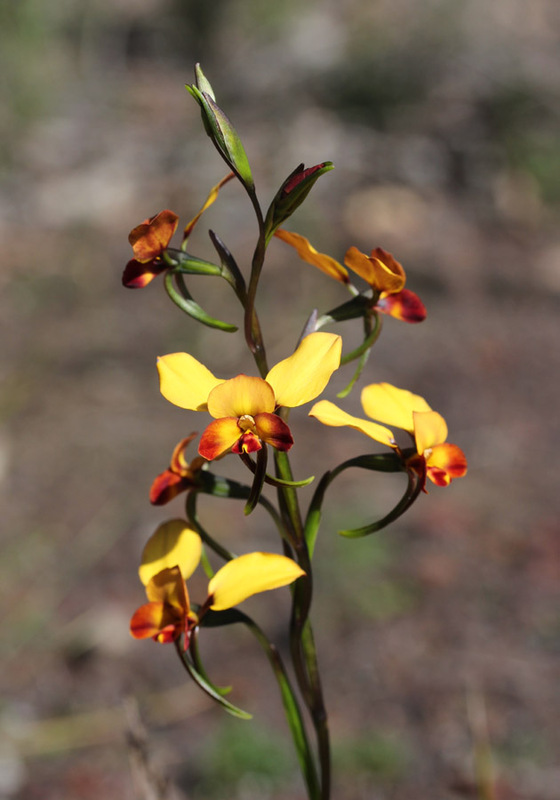 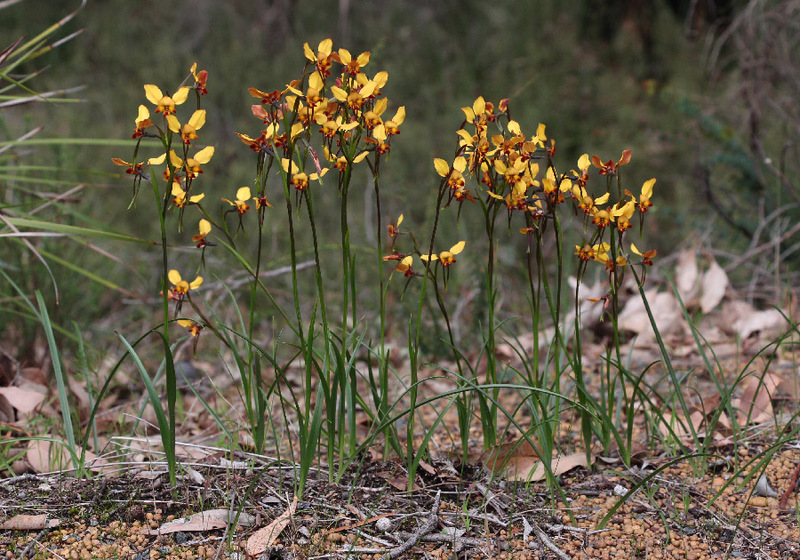 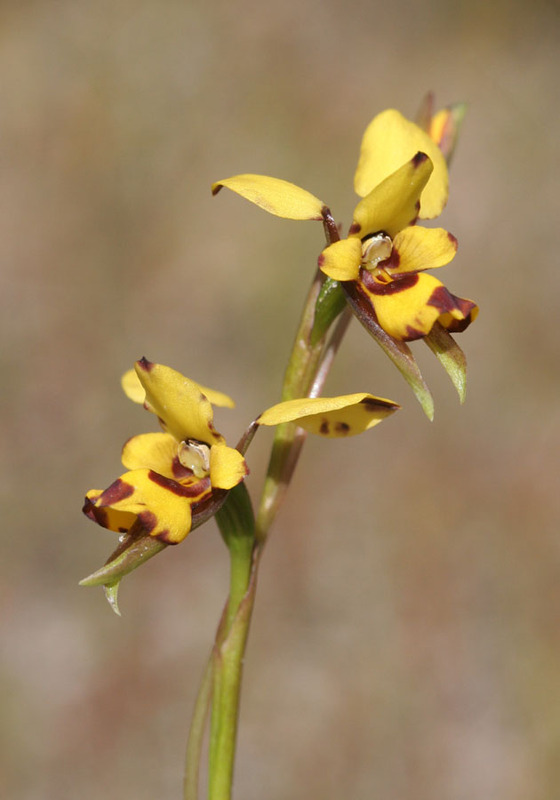 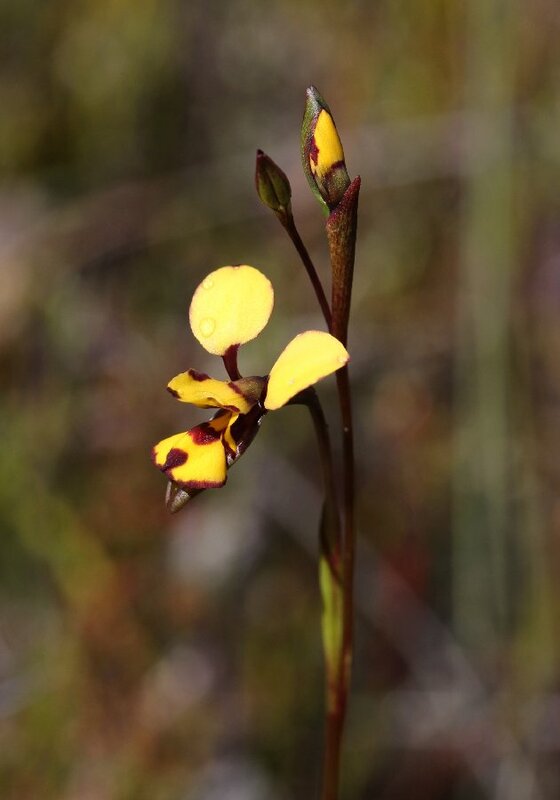 The donkey orchids are one of the most well known type of orchids in WA due to their distinctive, bright yellow flowers. 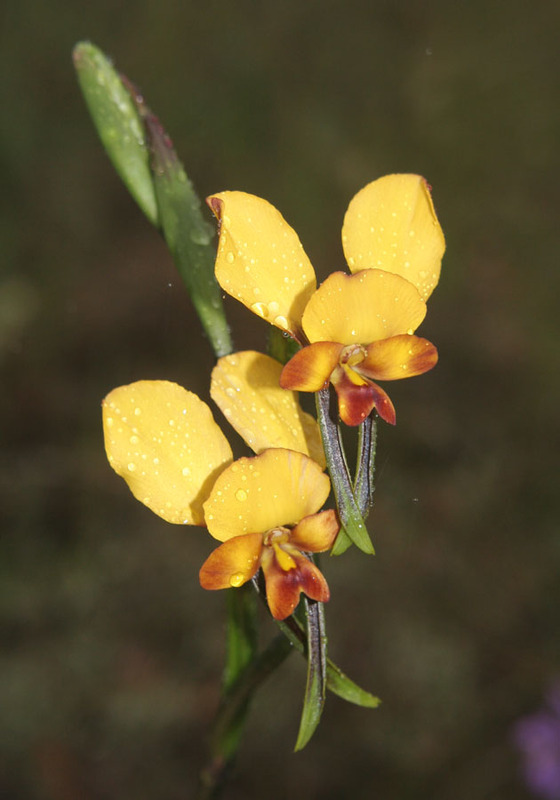 As a group, they are common and widespread over the entire south west in a great variety of habitats. 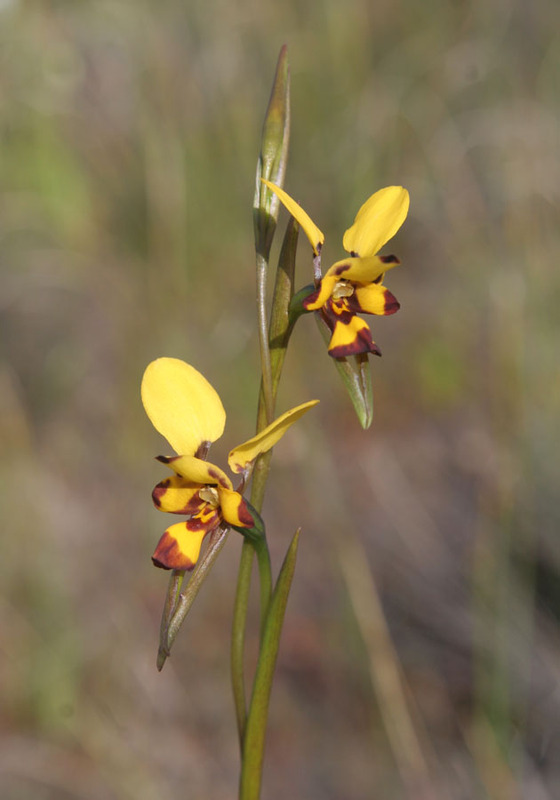 They can be found in many areas of remnant bushland in the Perth metropolitan area. 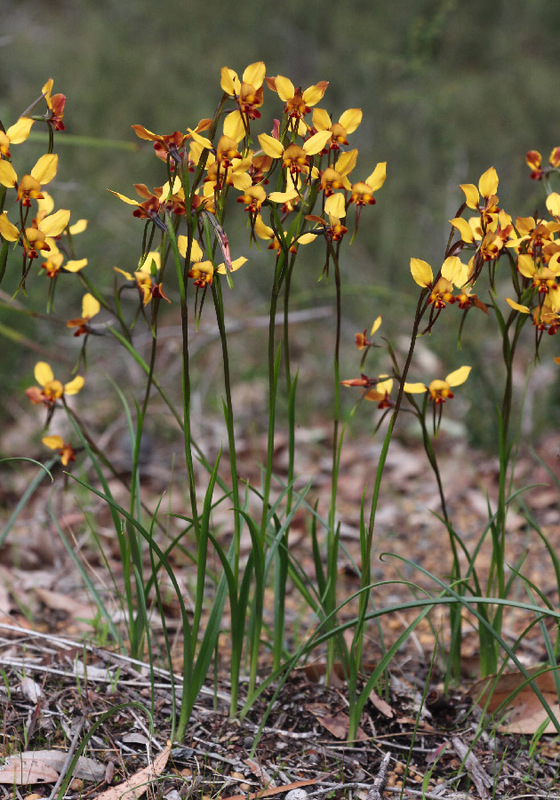 There are about 30 named species in WA. 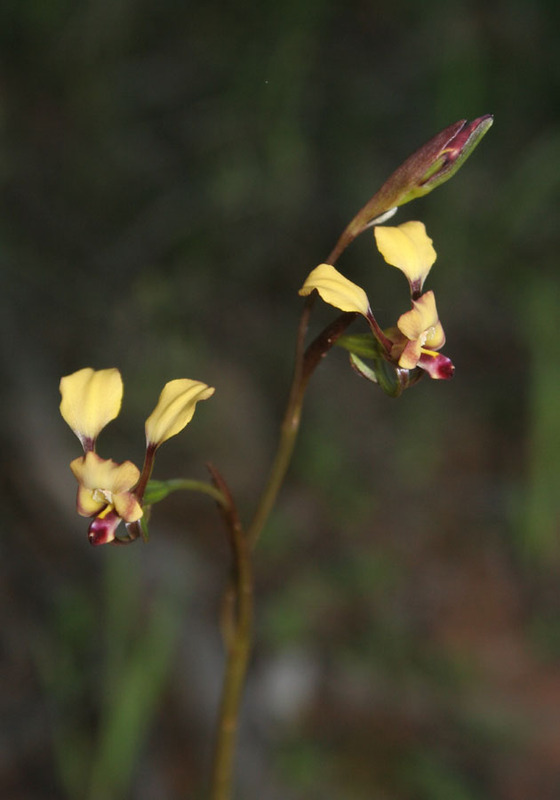 The first donkey orchids flower in late June (D. brumalis) with the last flowering into December and January along the south coast. 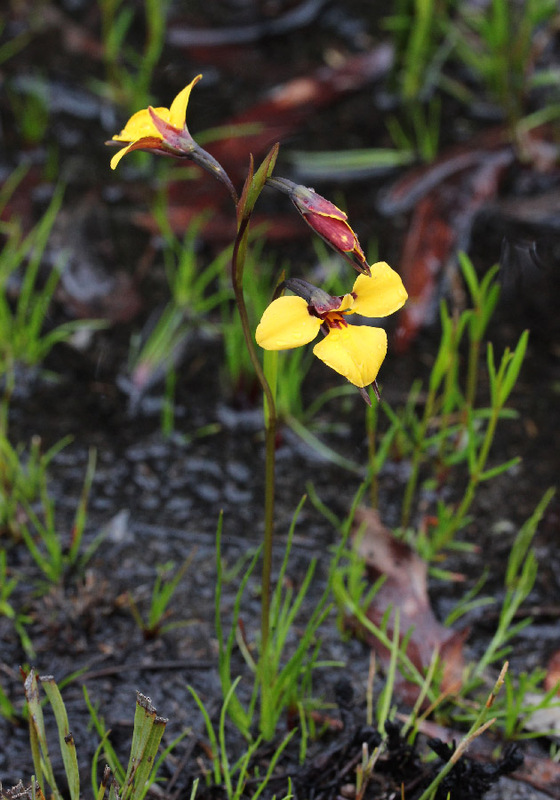 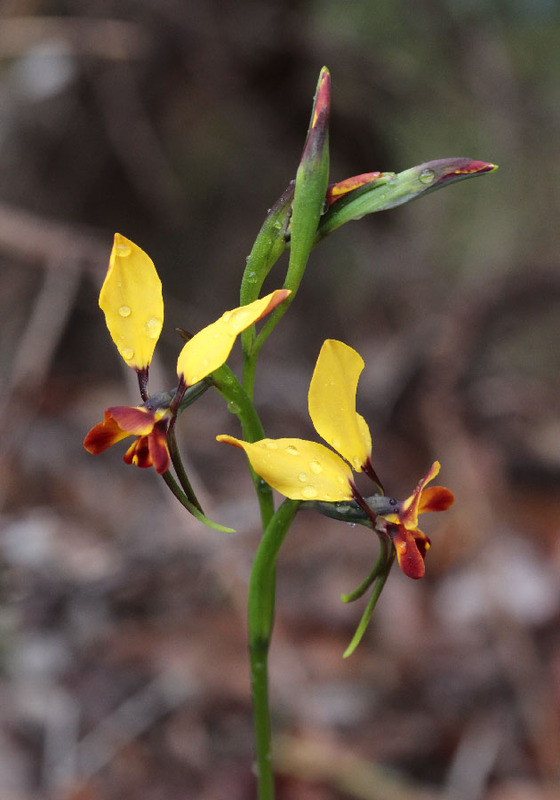 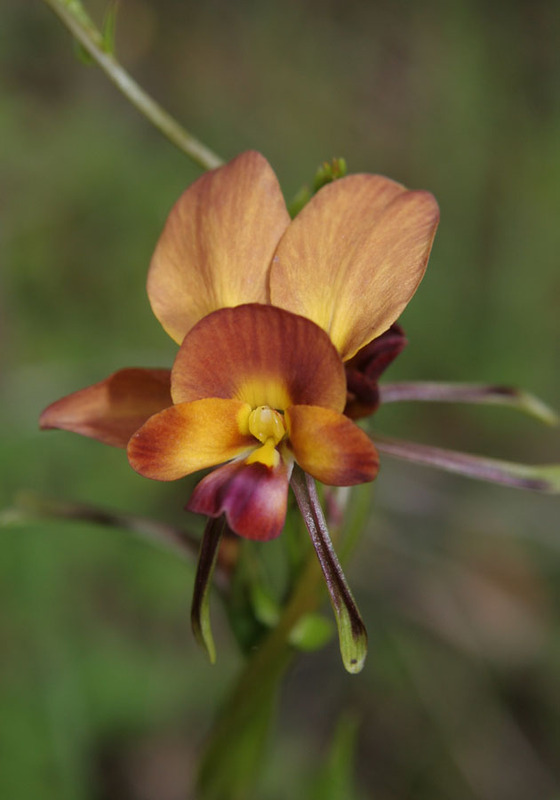 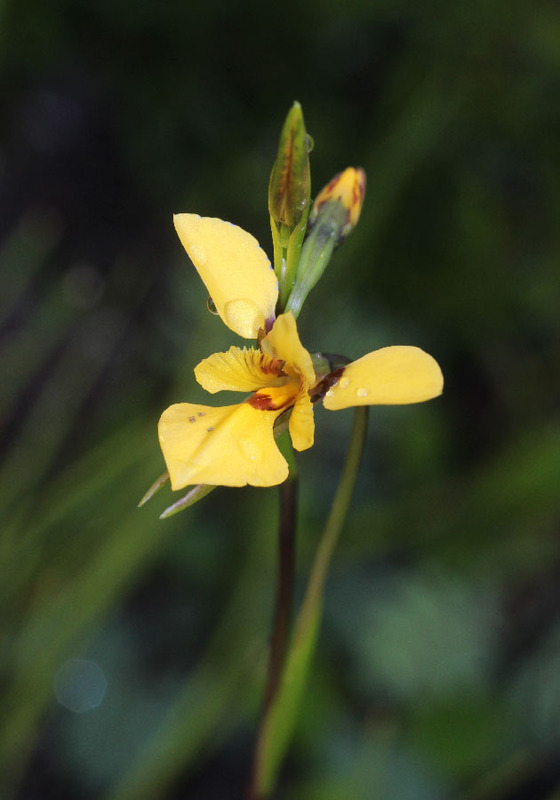 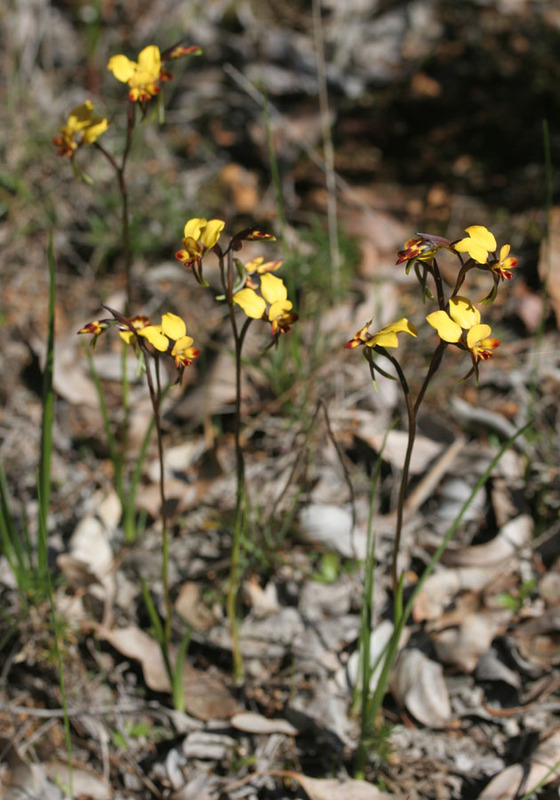 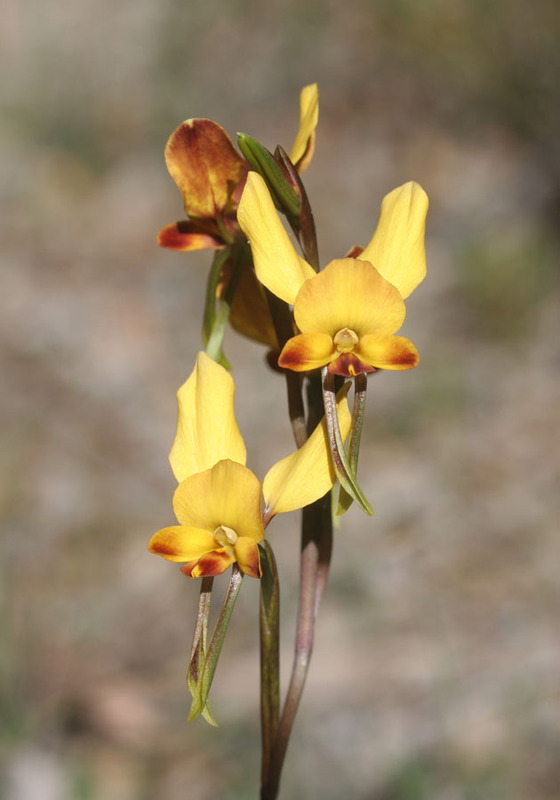 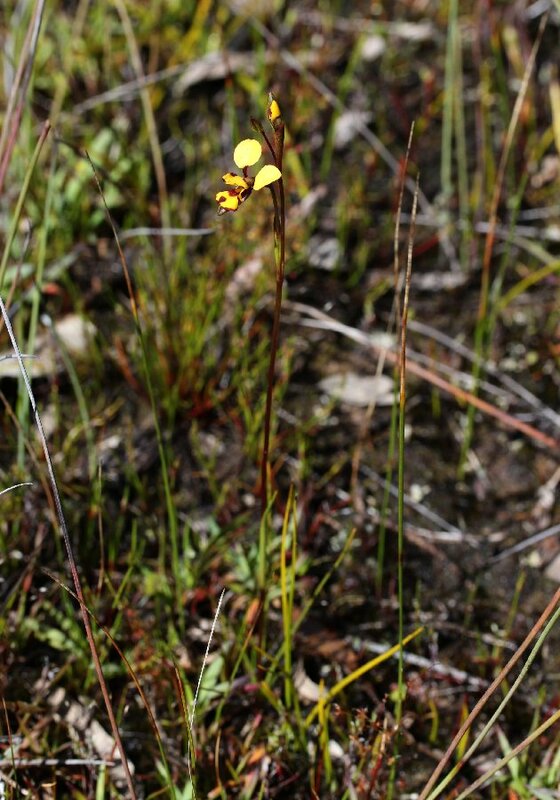 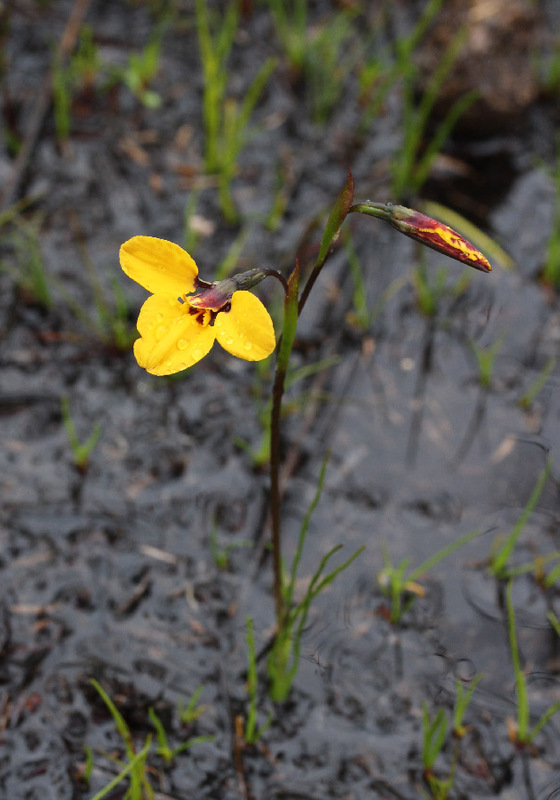 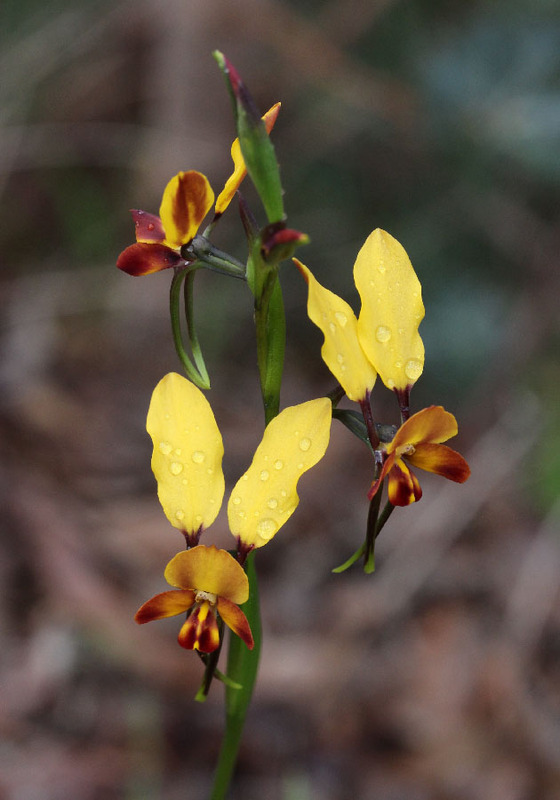 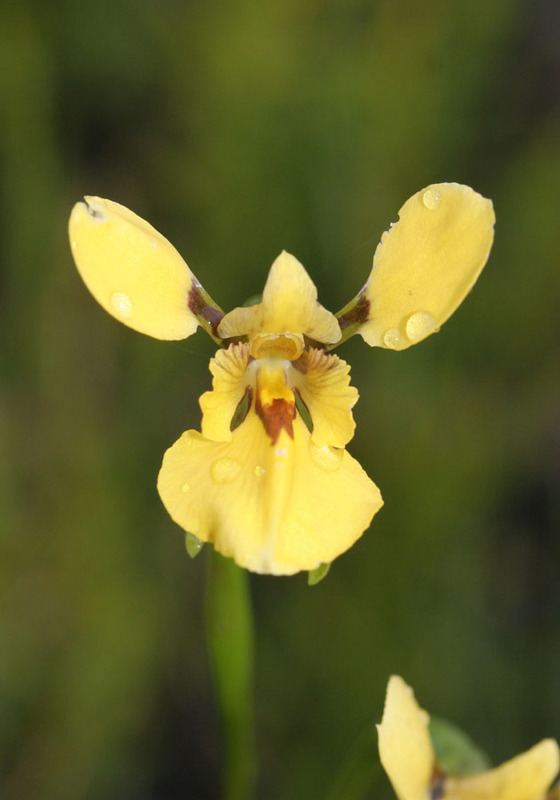 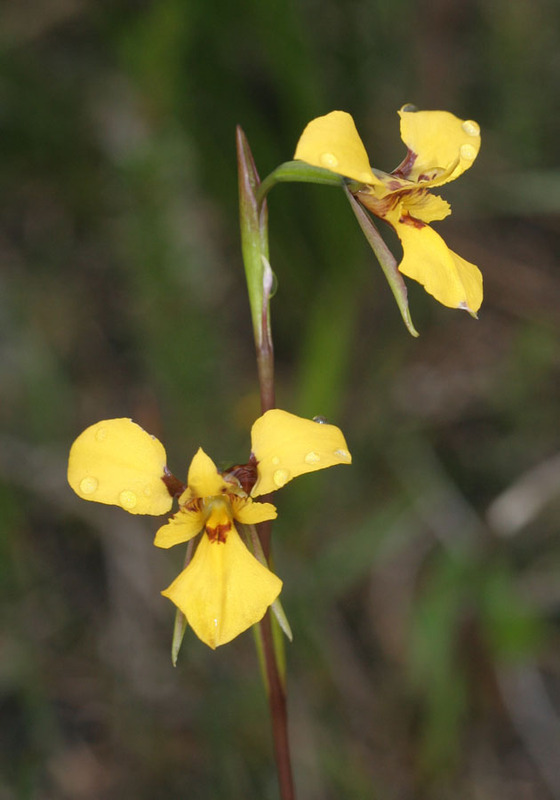 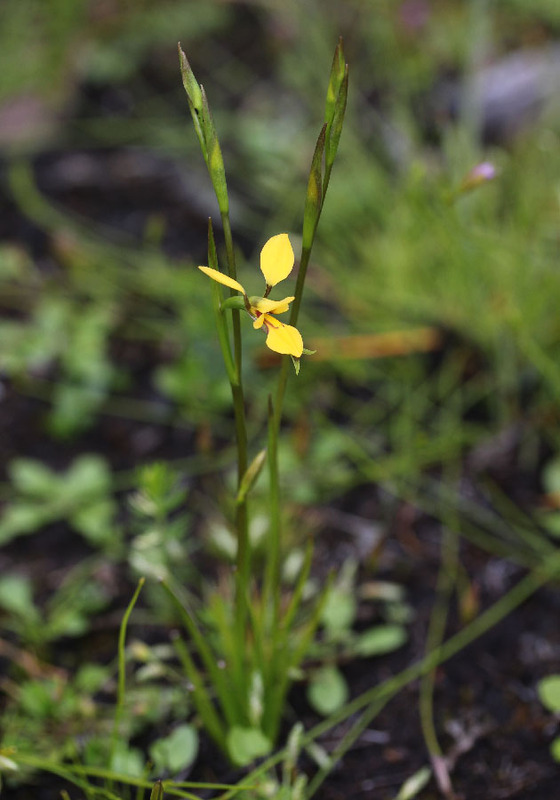 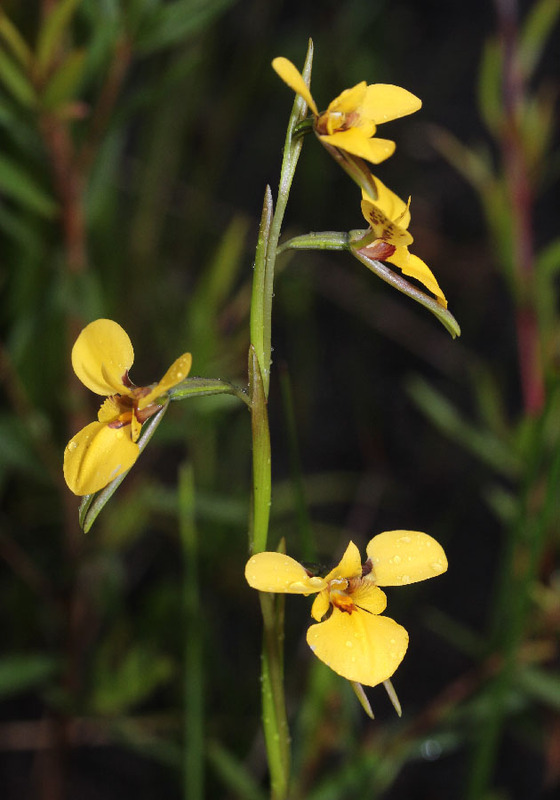 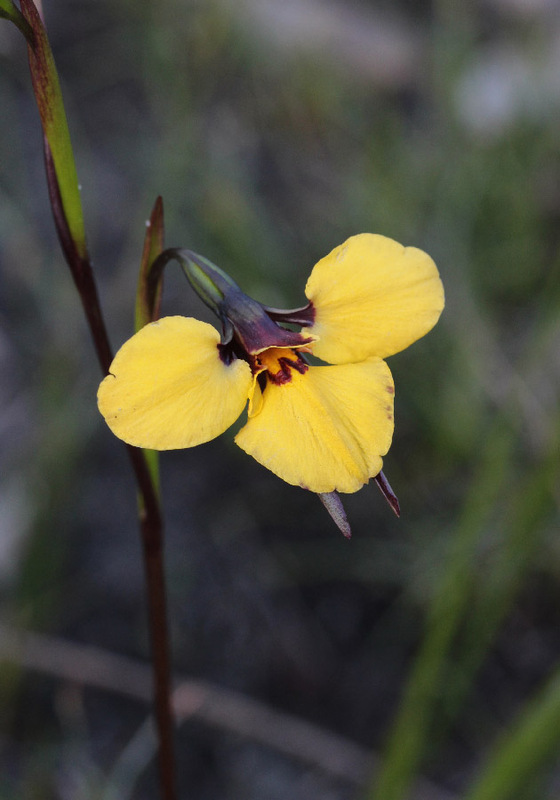 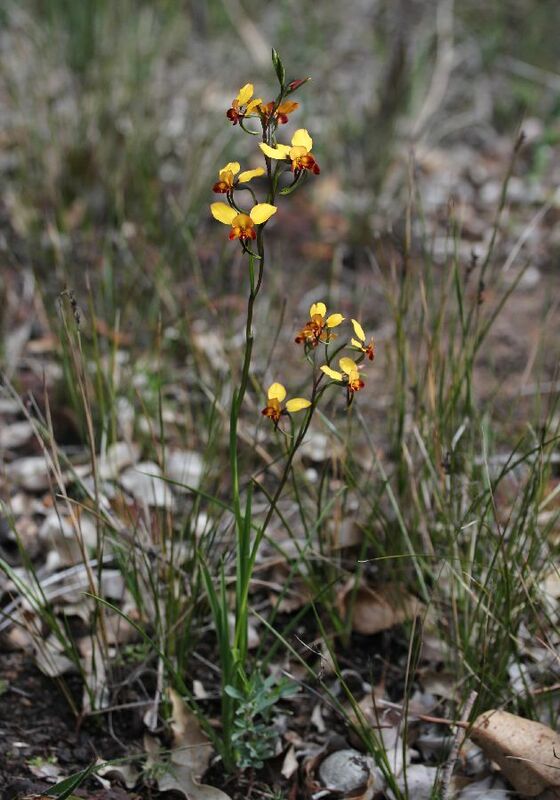 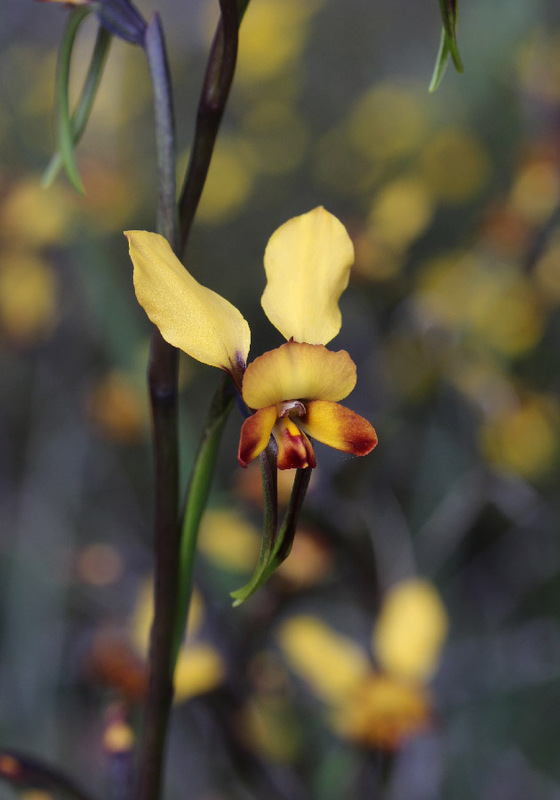 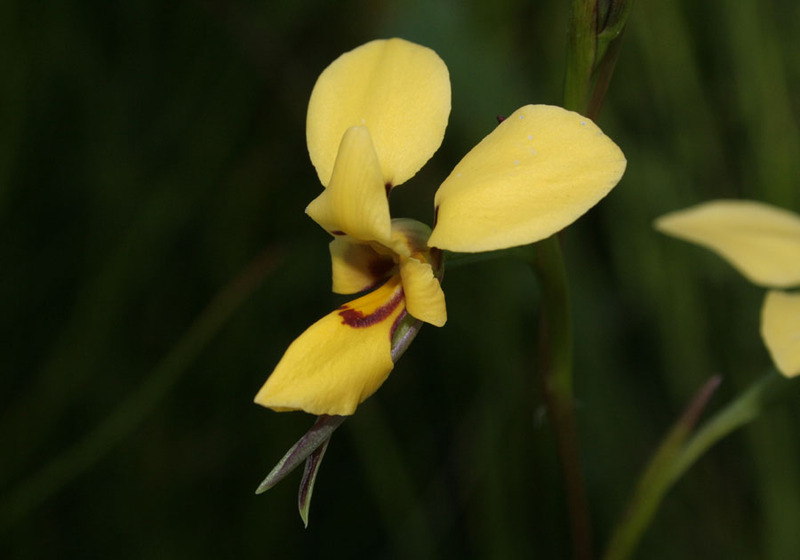 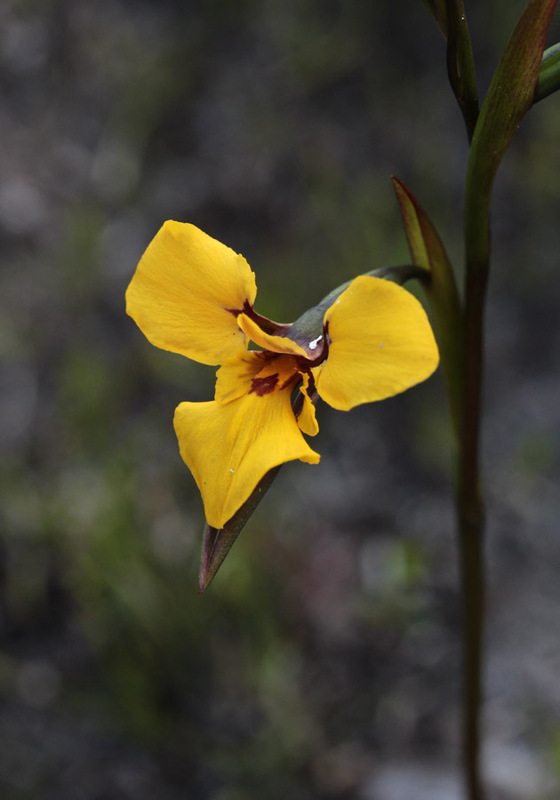 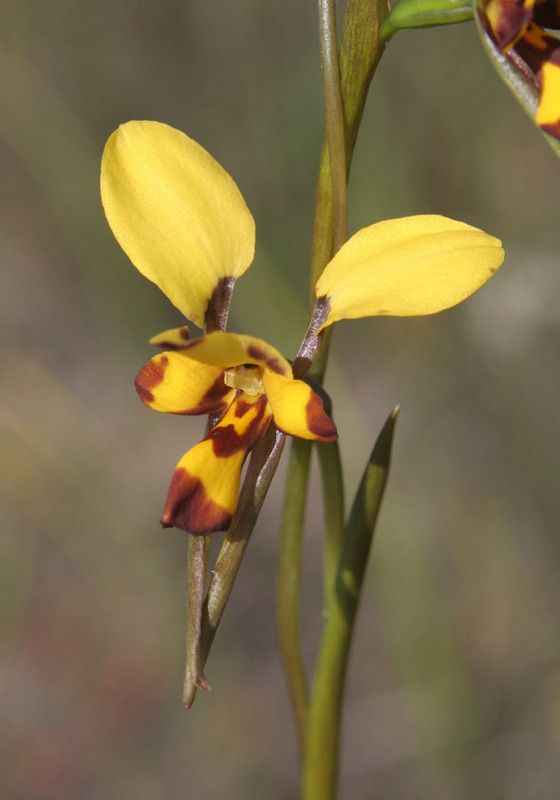 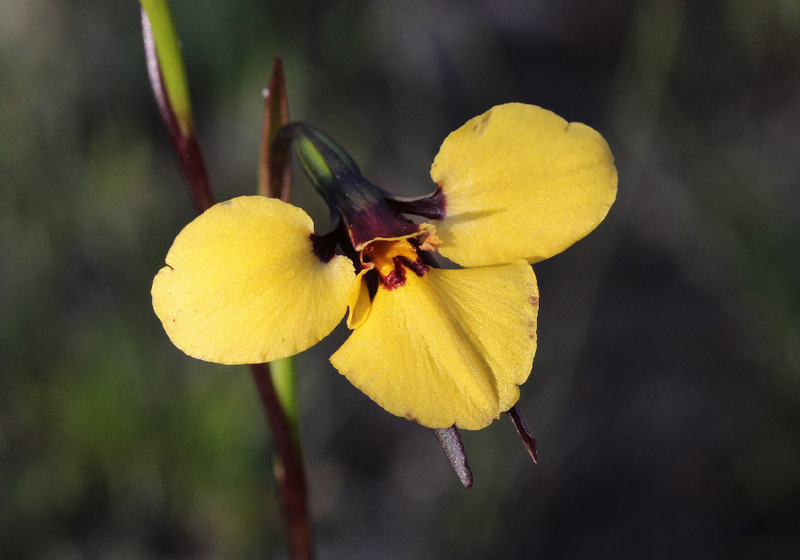 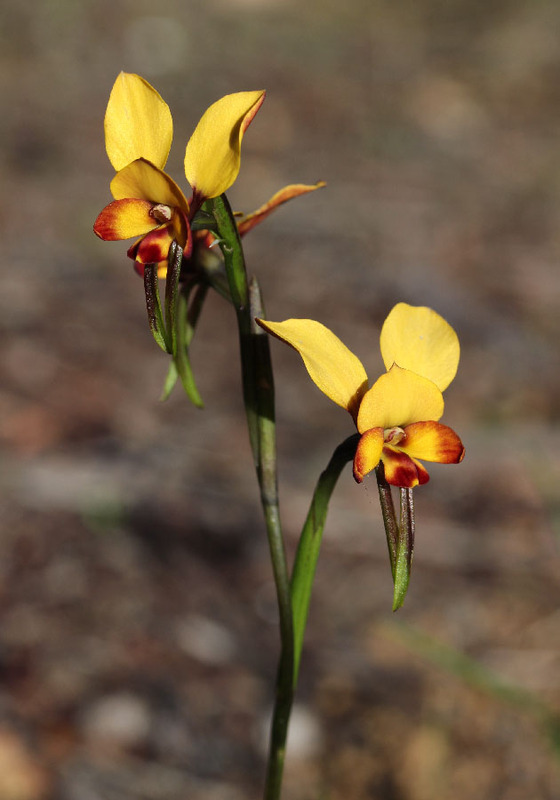 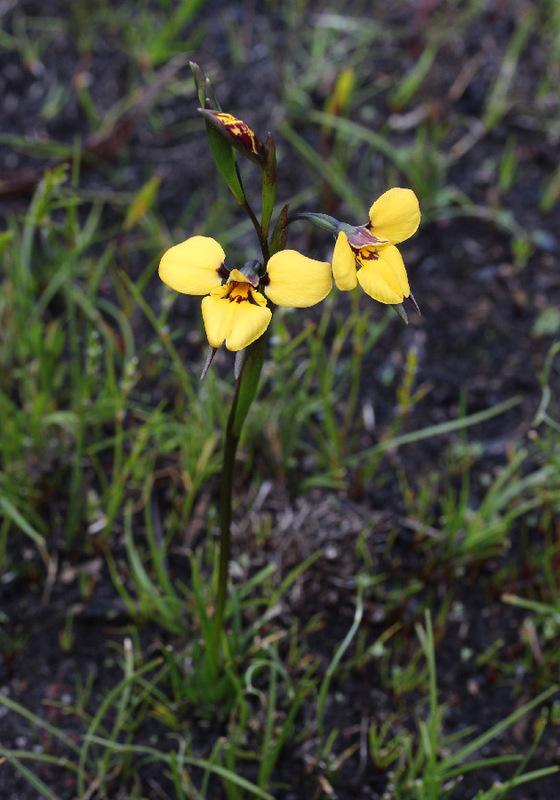 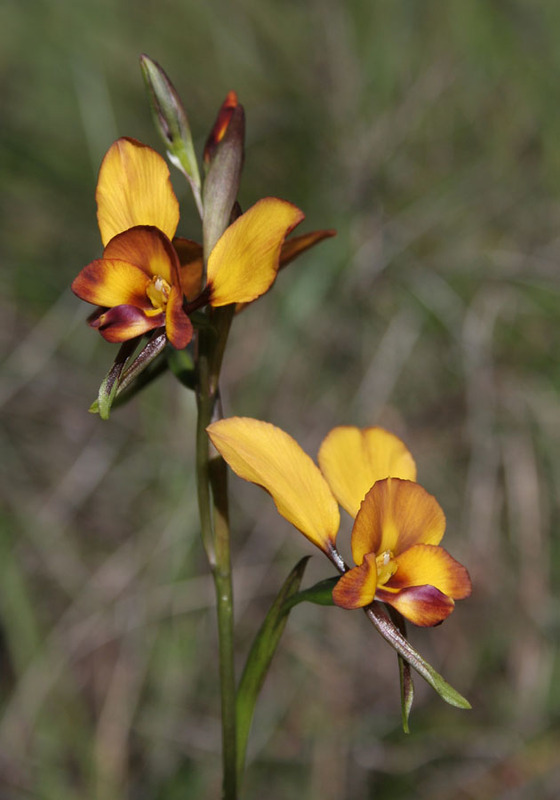 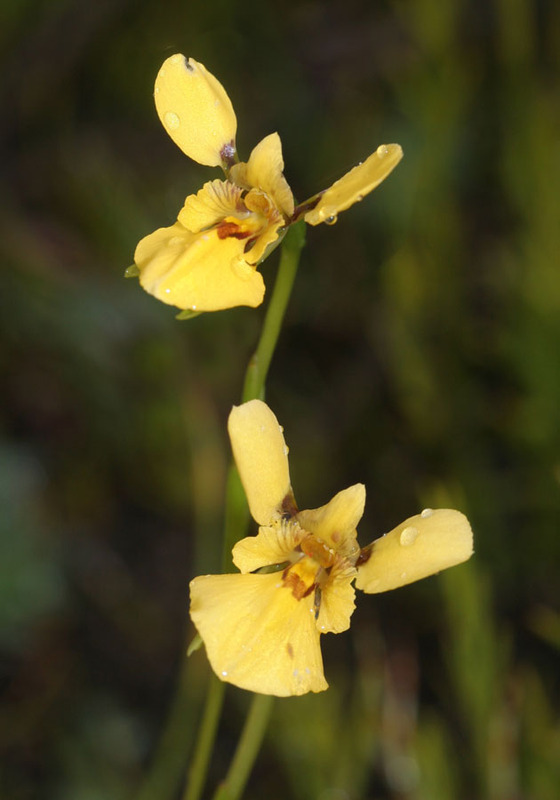 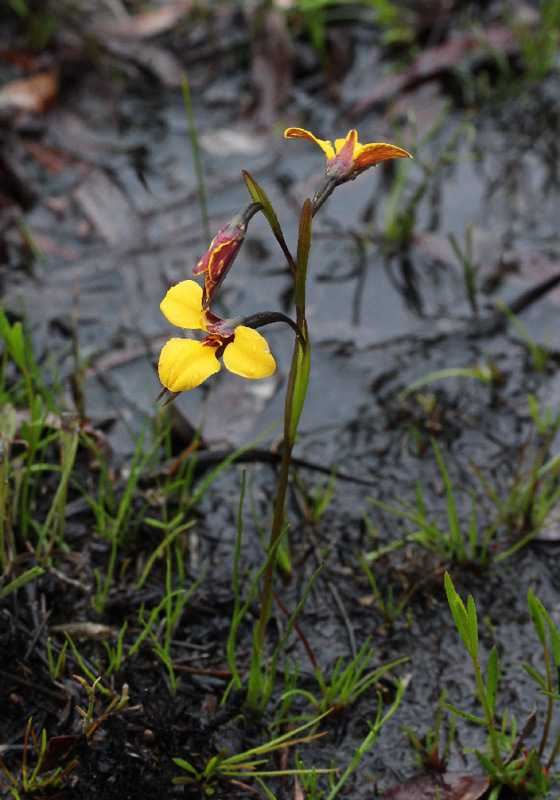 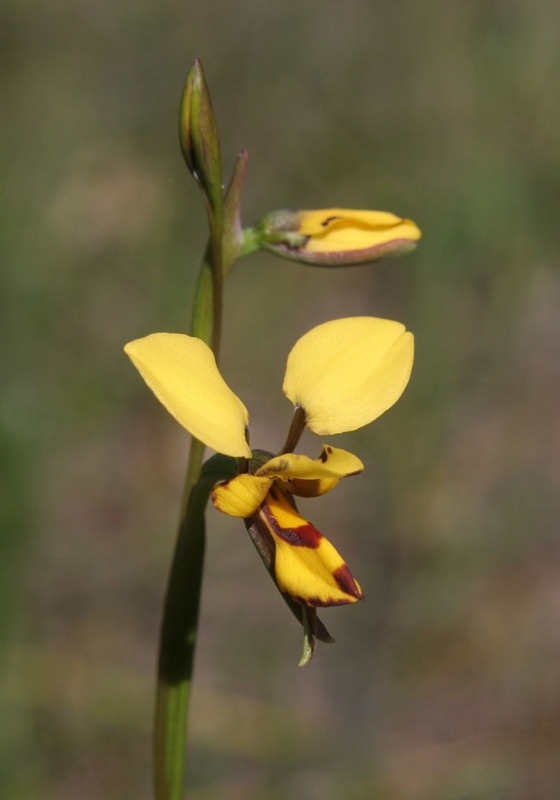 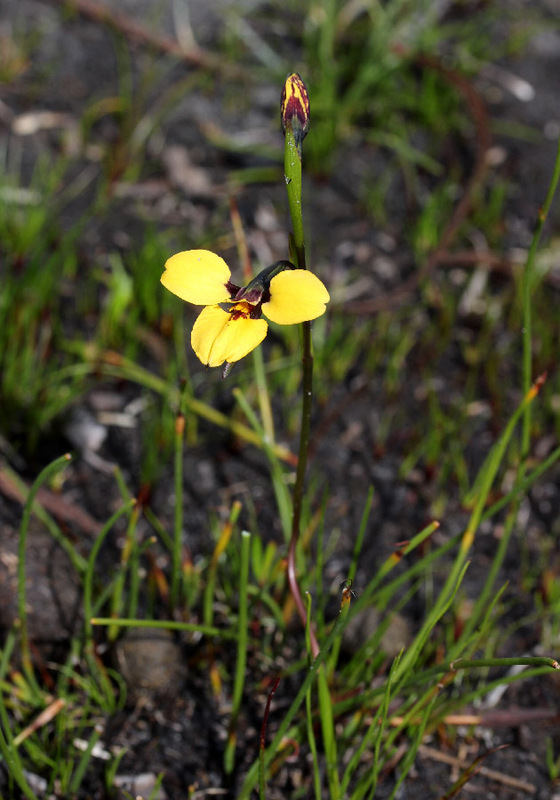 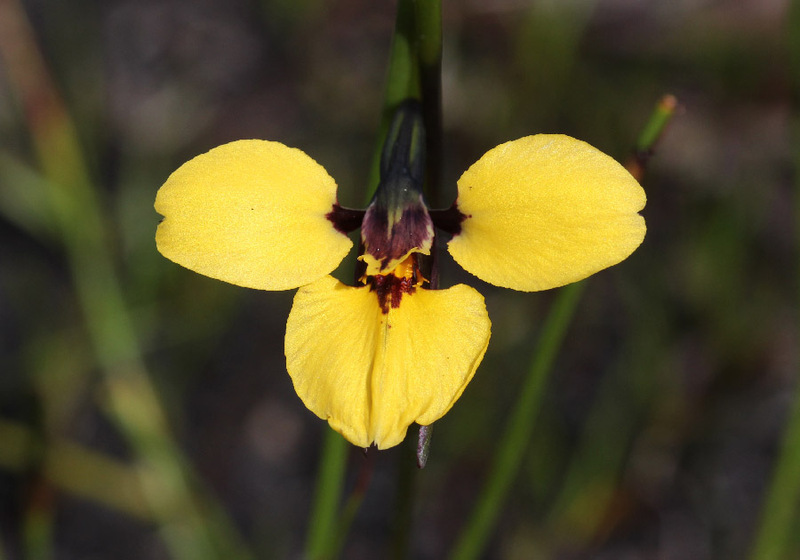 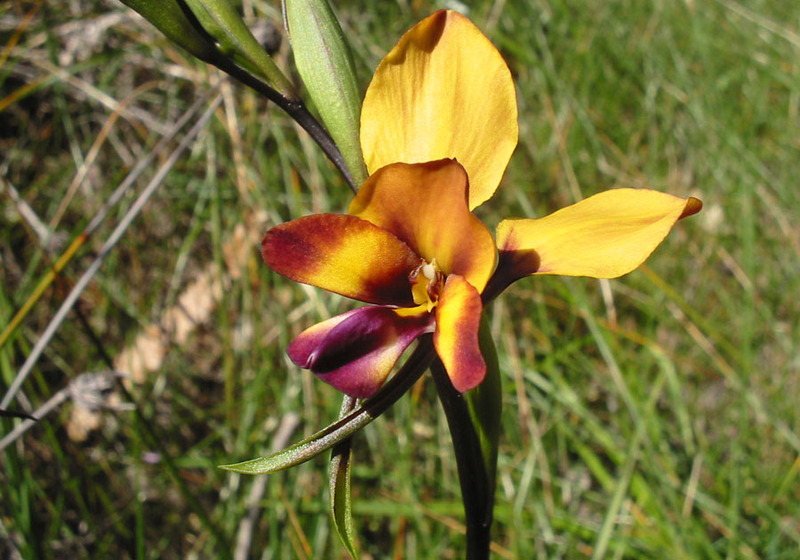 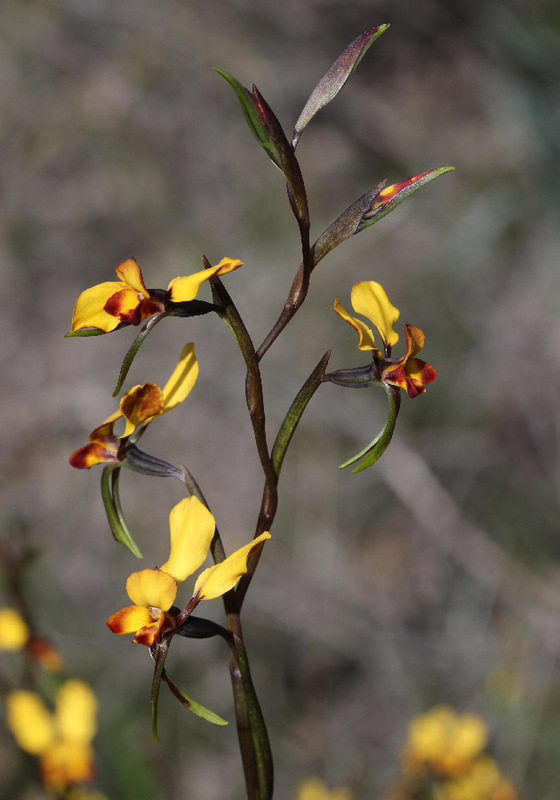 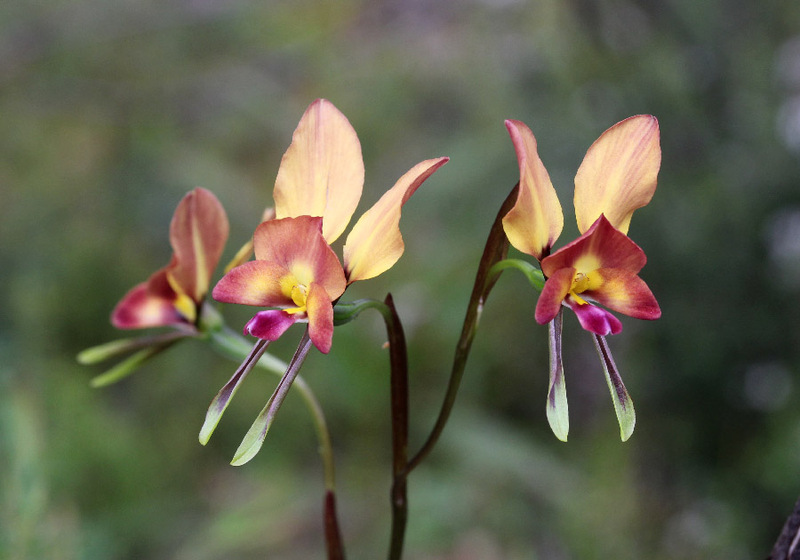 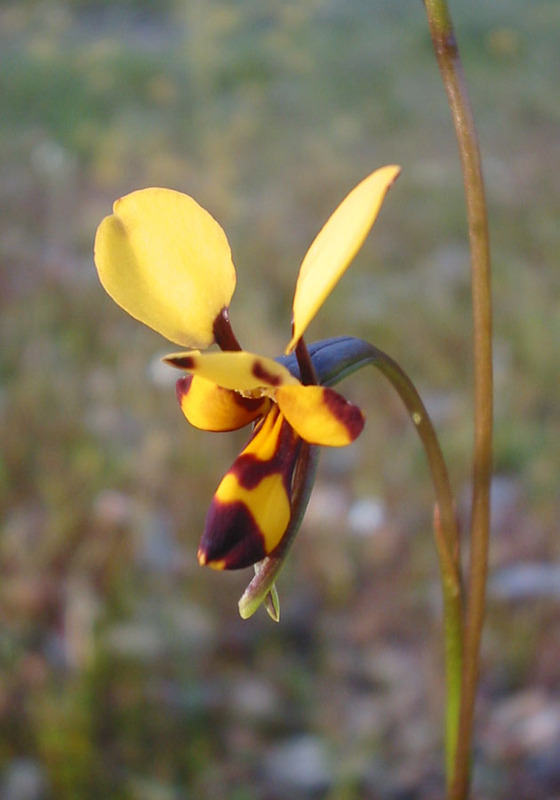 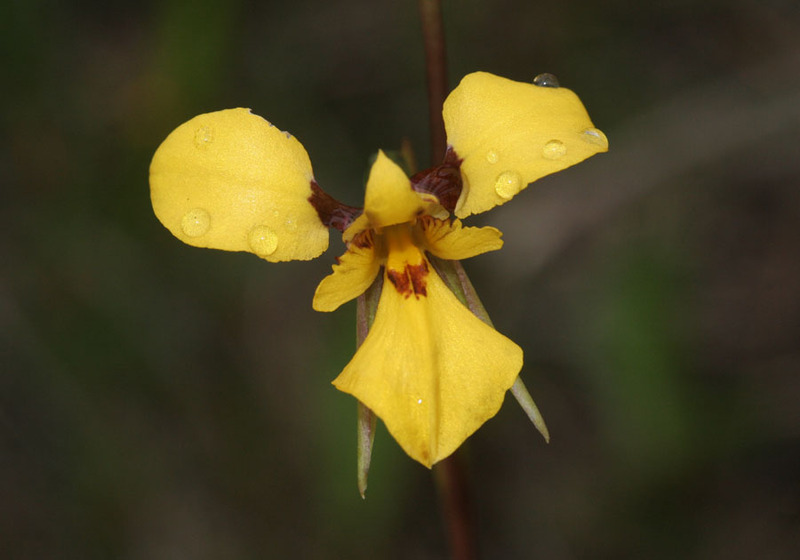 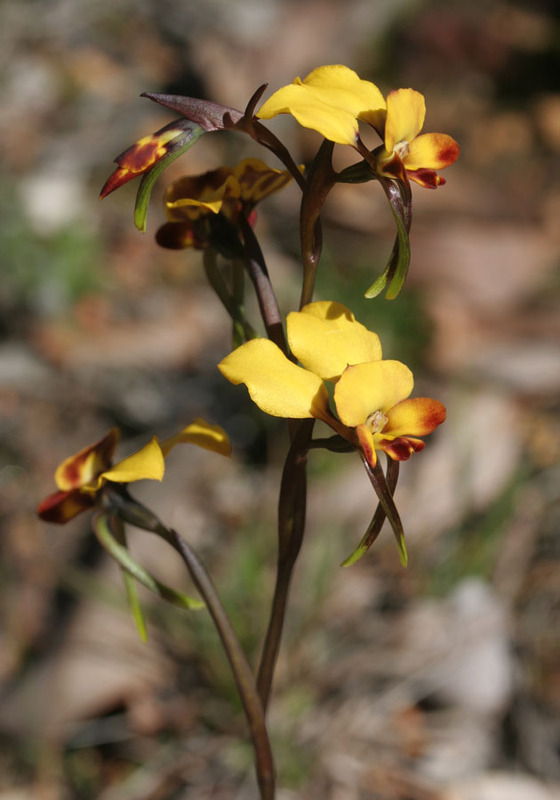 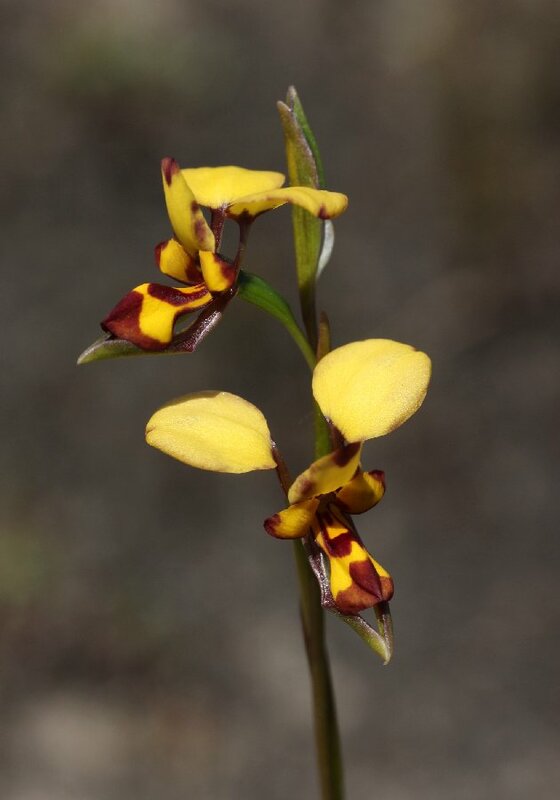 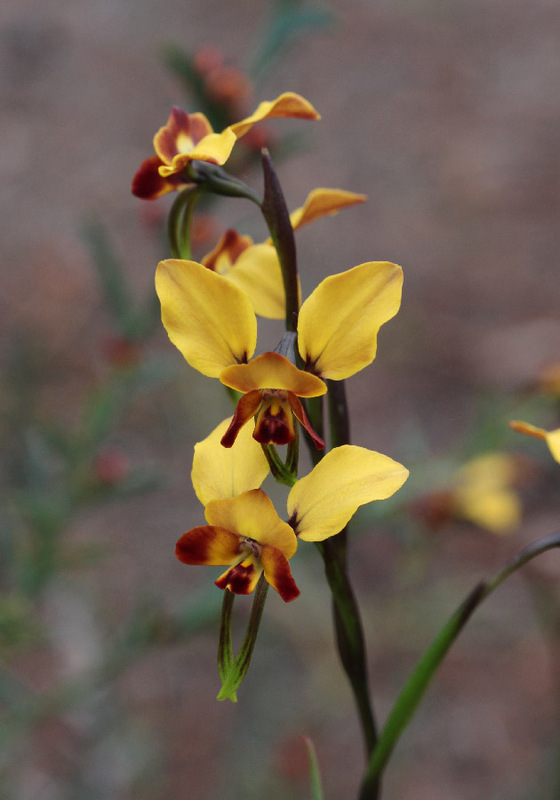 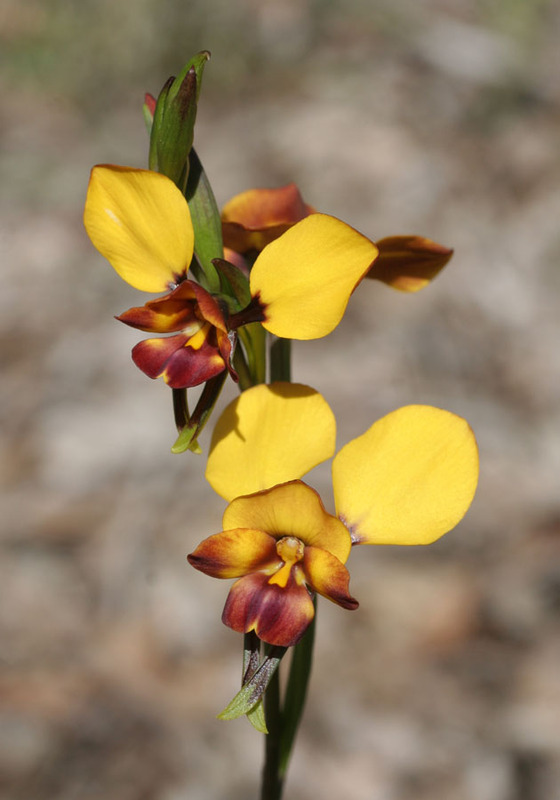 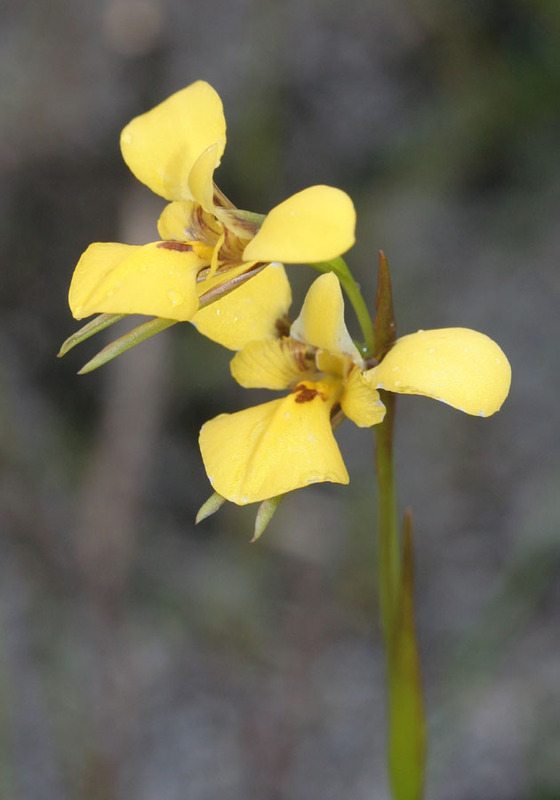 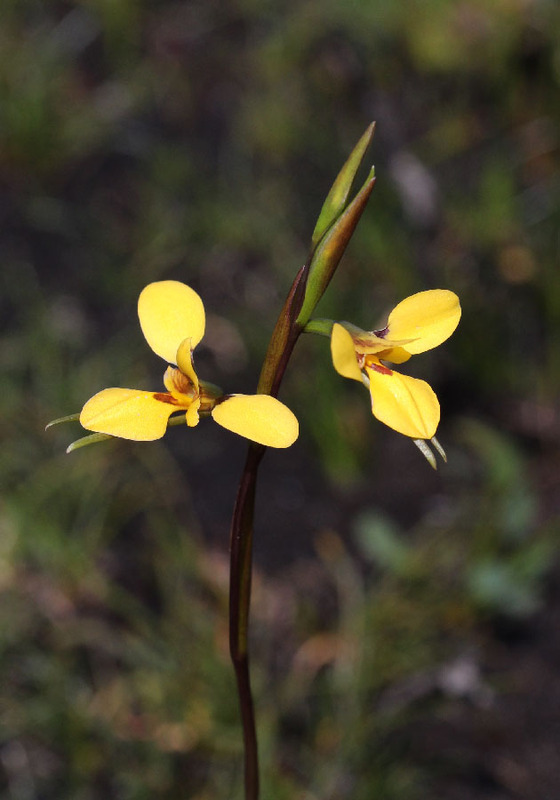 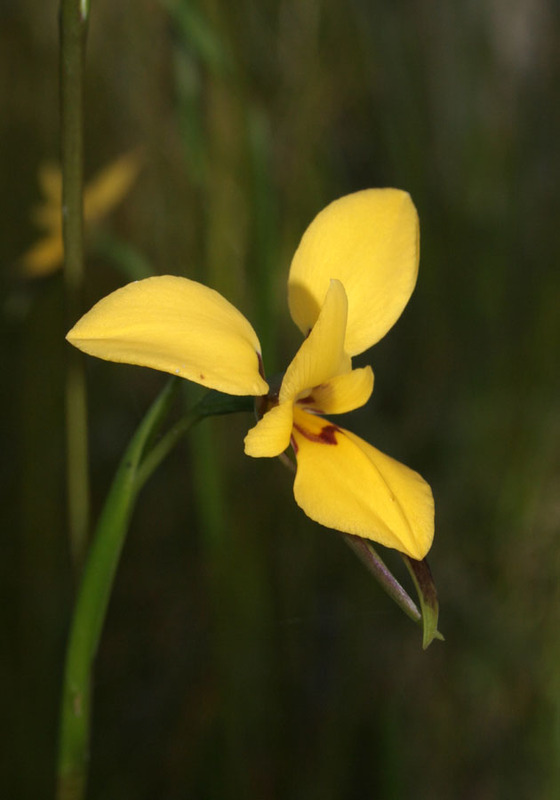 The Winter Donkey Orchid is the first Diuris to flower each year, starting in late June. 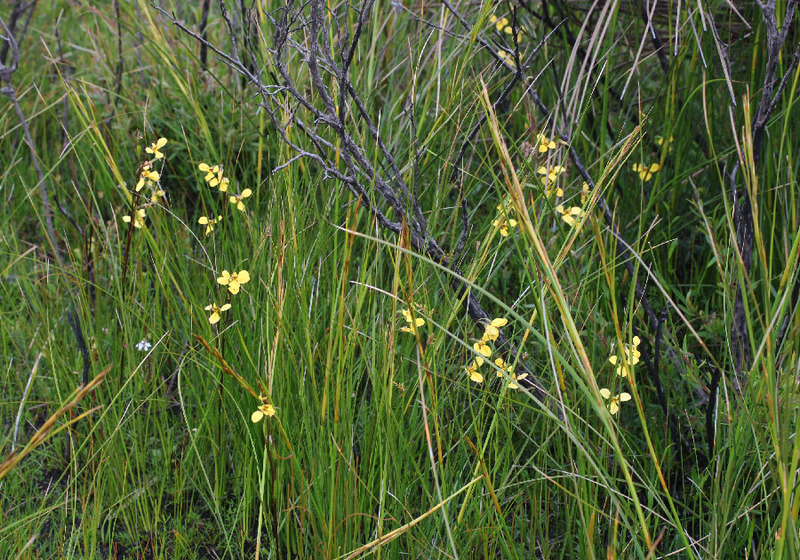 It is common in the hills above Perth. 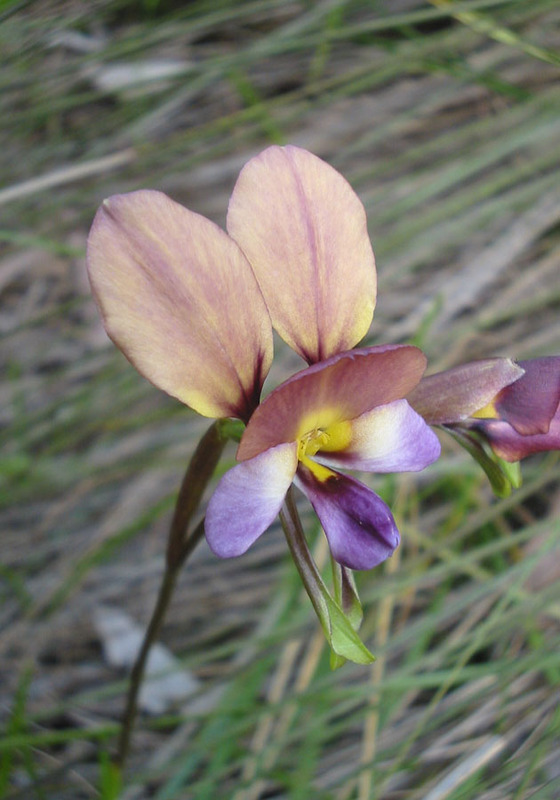 The Purple Pansy Orchid is much the same in shape and size as the Winter Donkey Orchid but is much more colourful with varying amounts of purple. 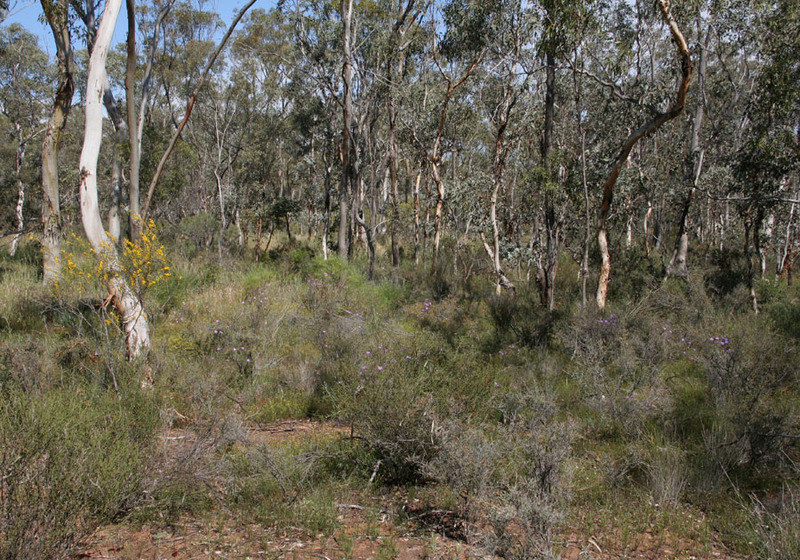 It is found between Perth and Albany. 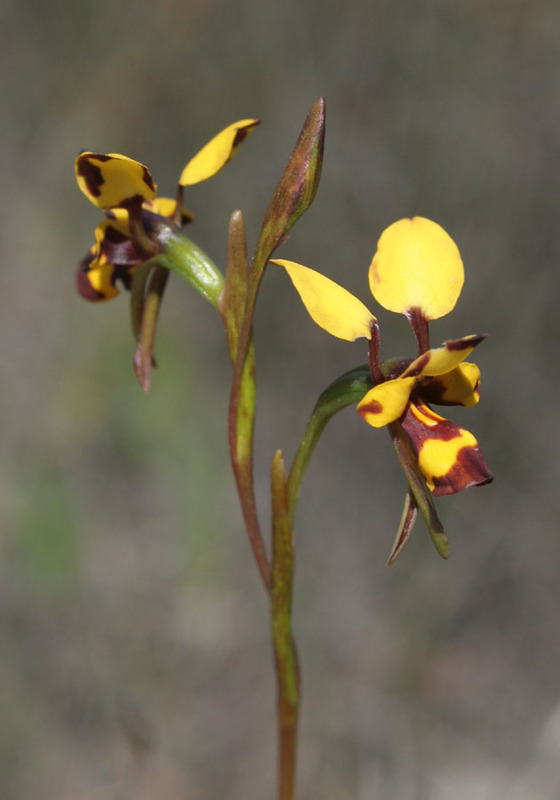 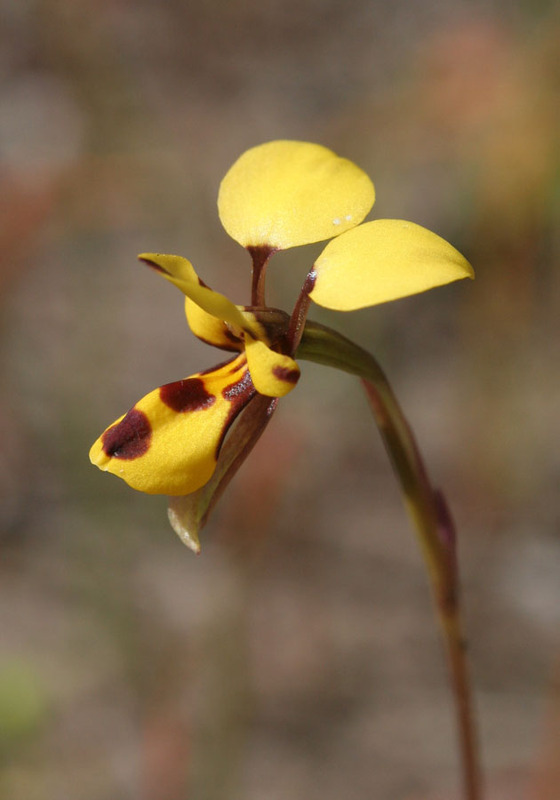 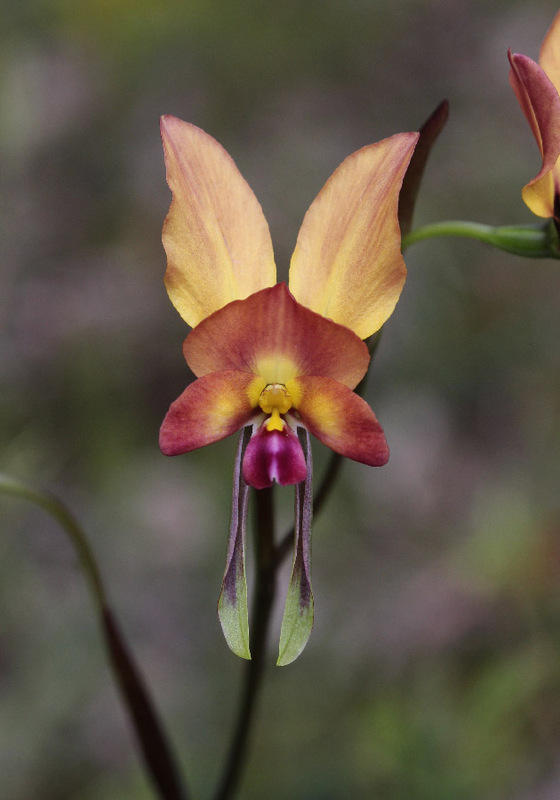 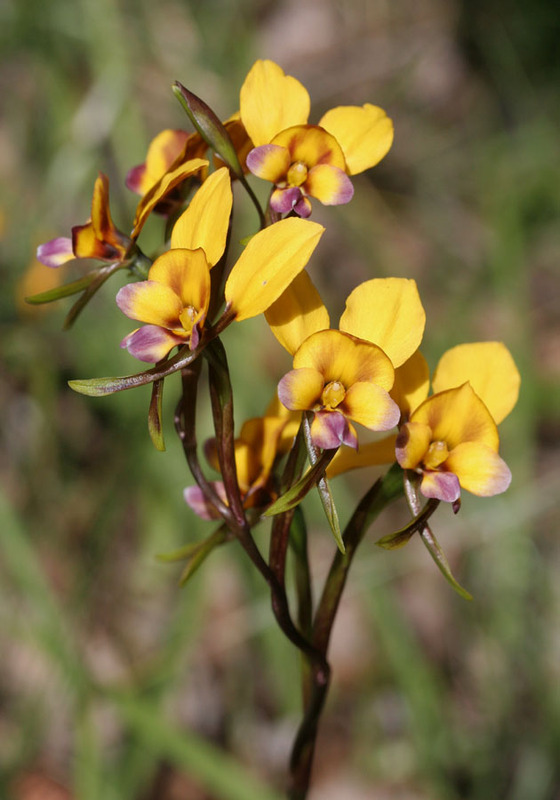 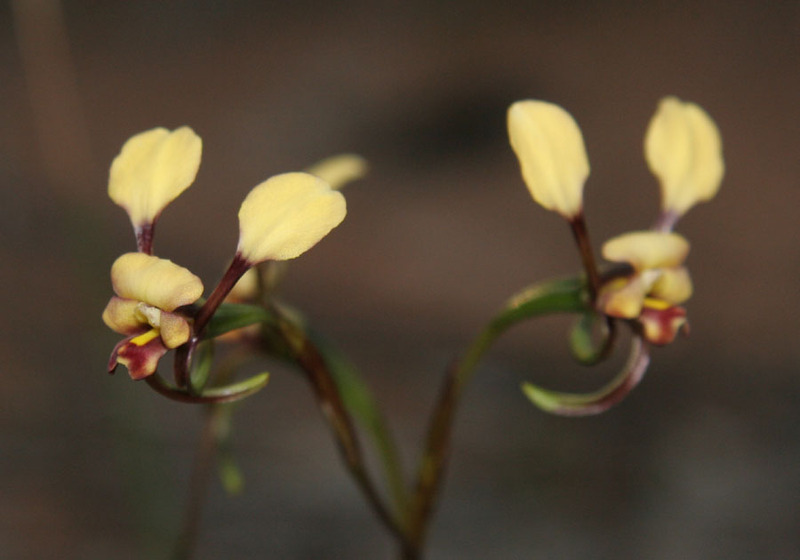 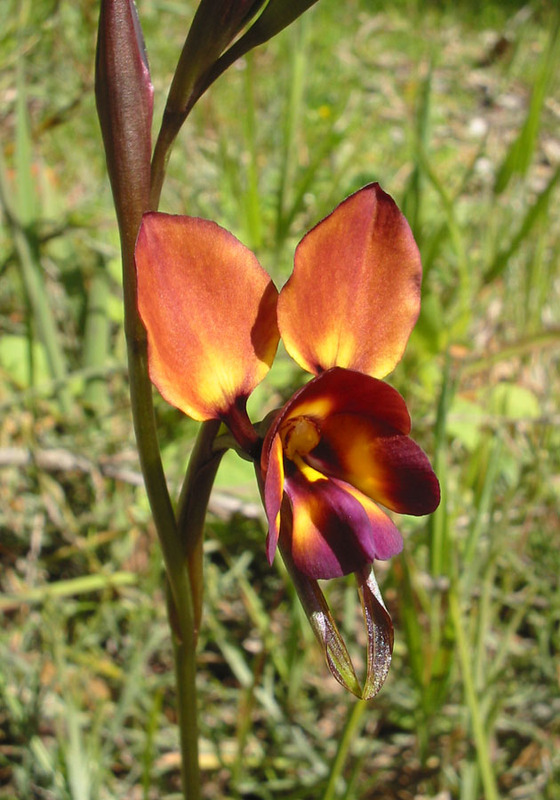 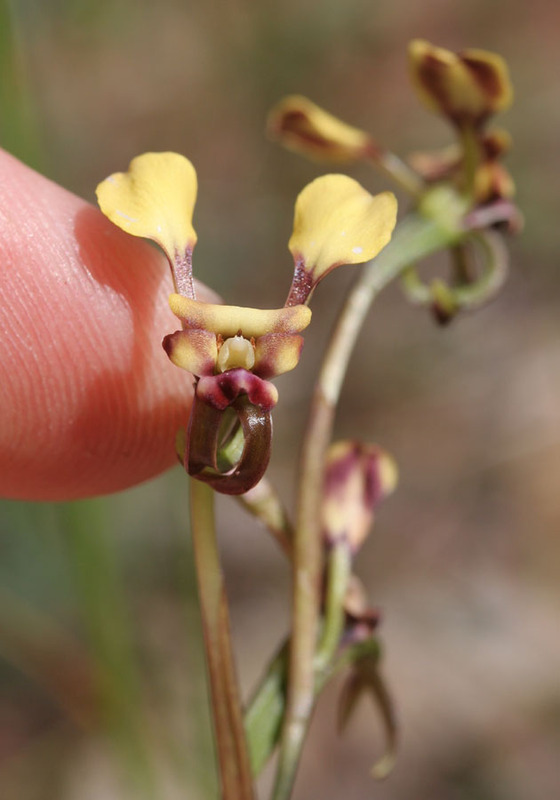 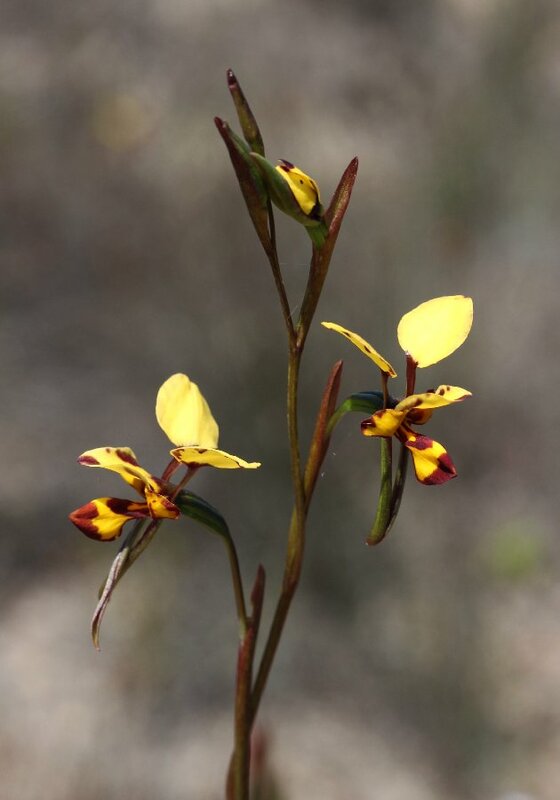 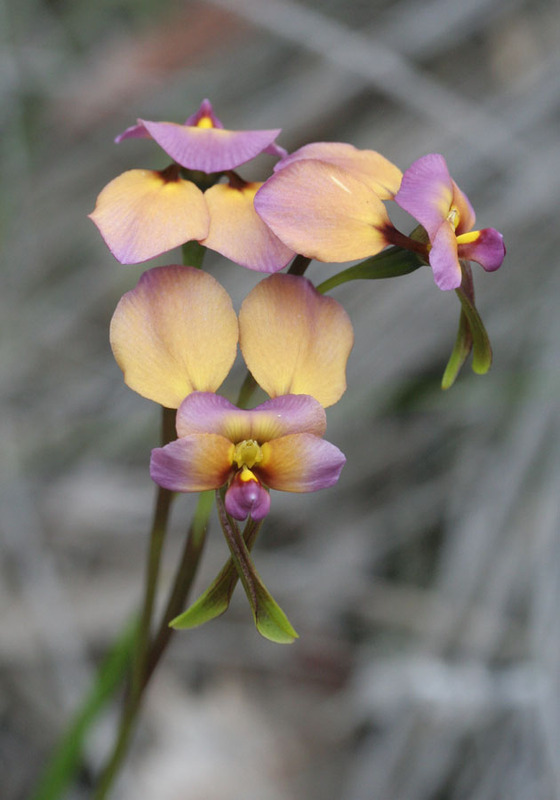 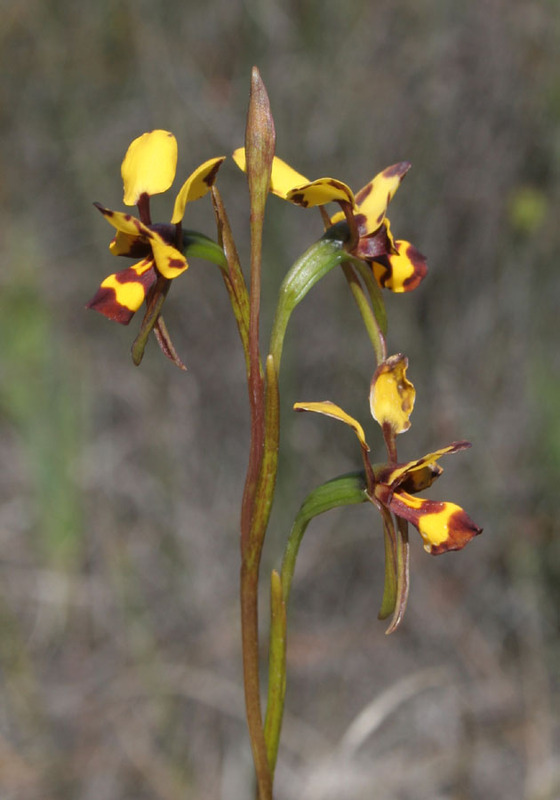 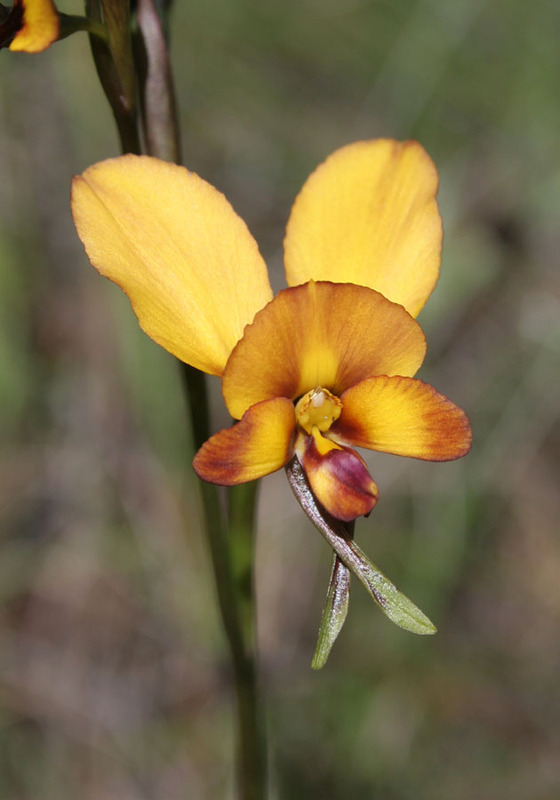 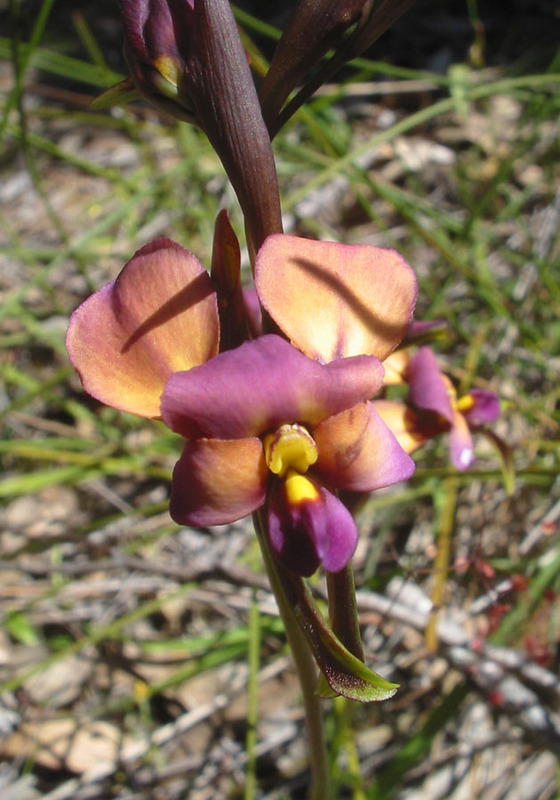 The Dunsborough Donkey Orchid is similar to the Purple Pansy Orchid. 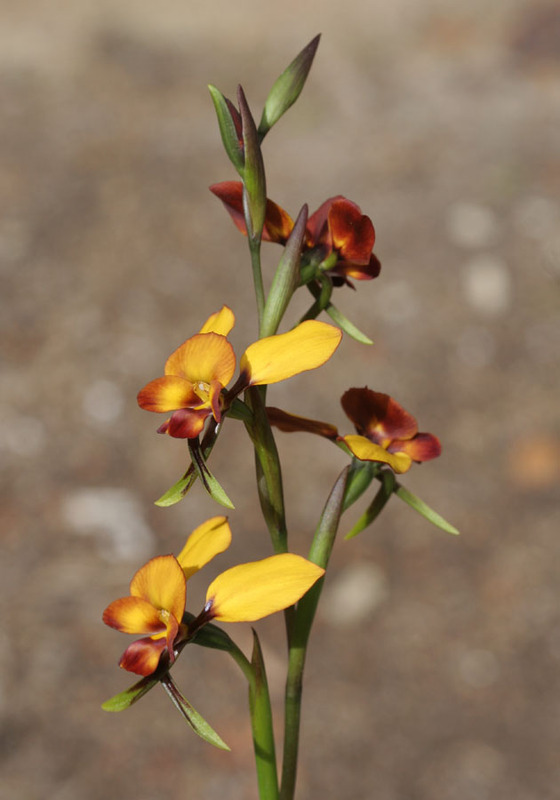 It is distinguished by its larger flowers with brownish, rather than purple flowers. 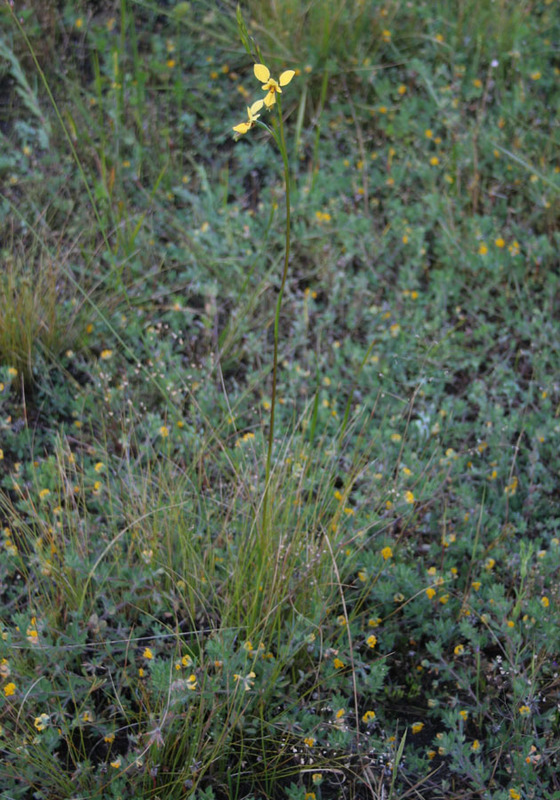 It also has much taller plants and can reach 50cm tall. 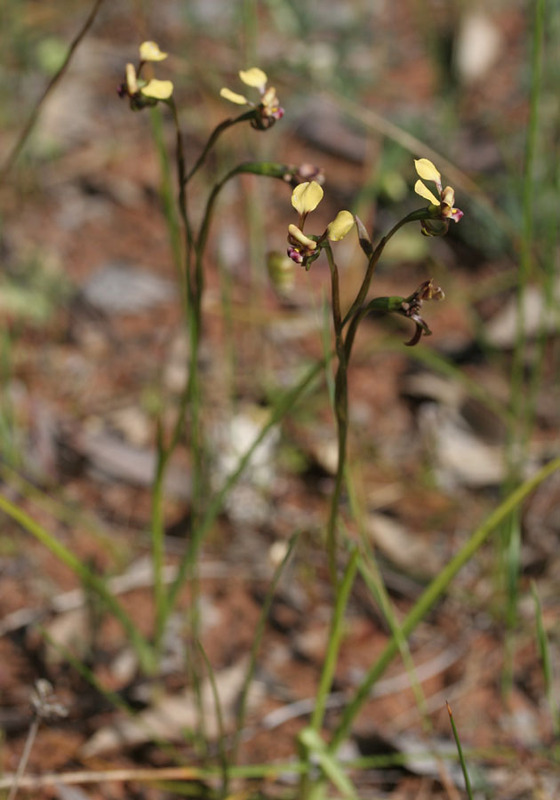 It is found between Dunsborough and Albany, usually in coastal areas. 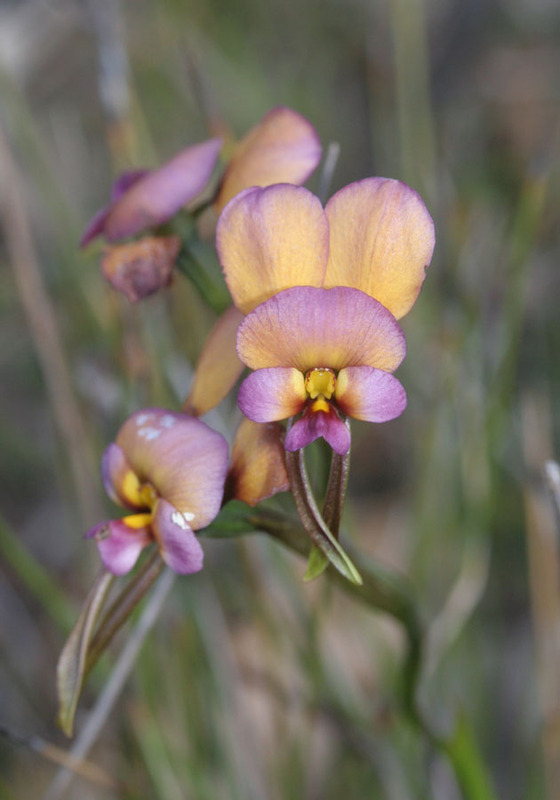 This orchid is similar to the Purple Pansy but has larger flowers with less purple colouring and much taller plants. 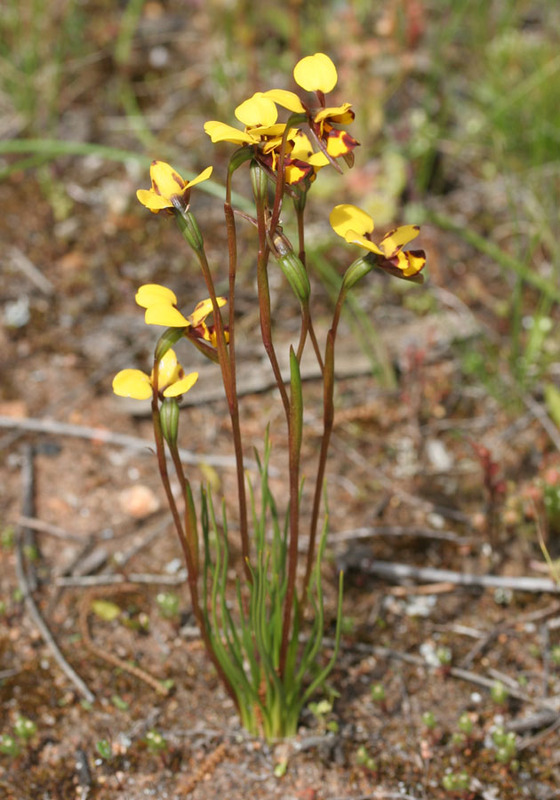 It is common in remnant bushland in Perth. 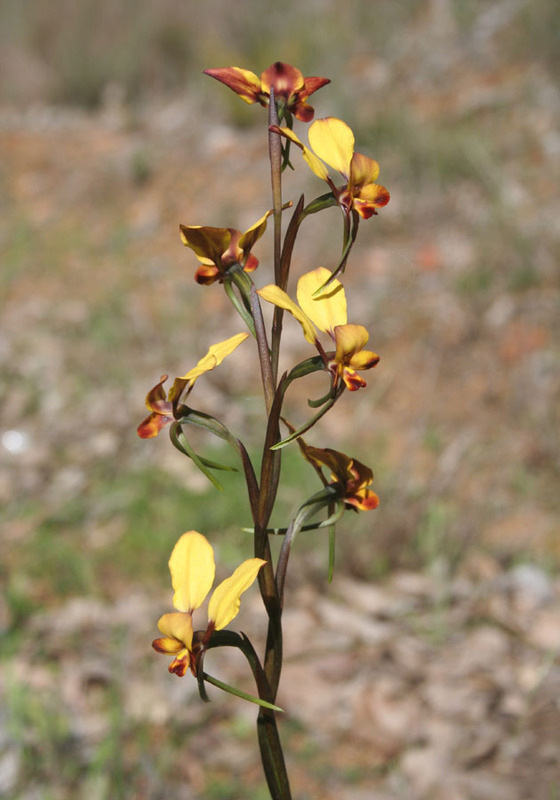 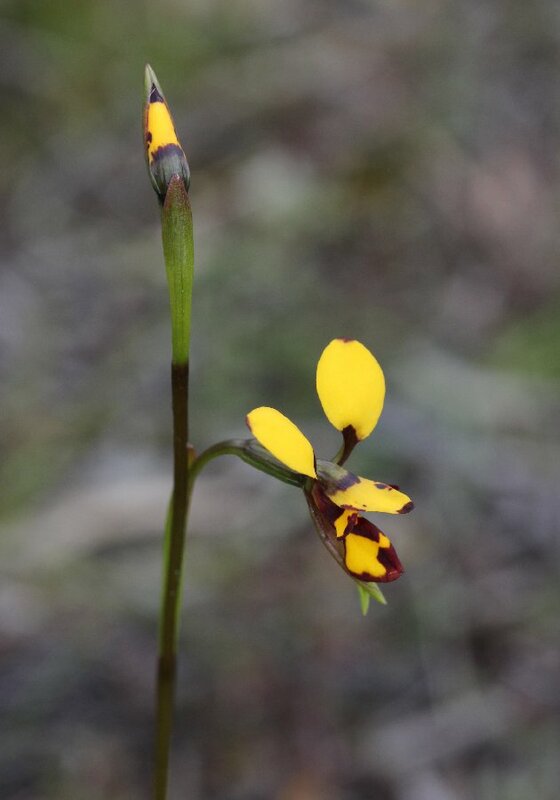 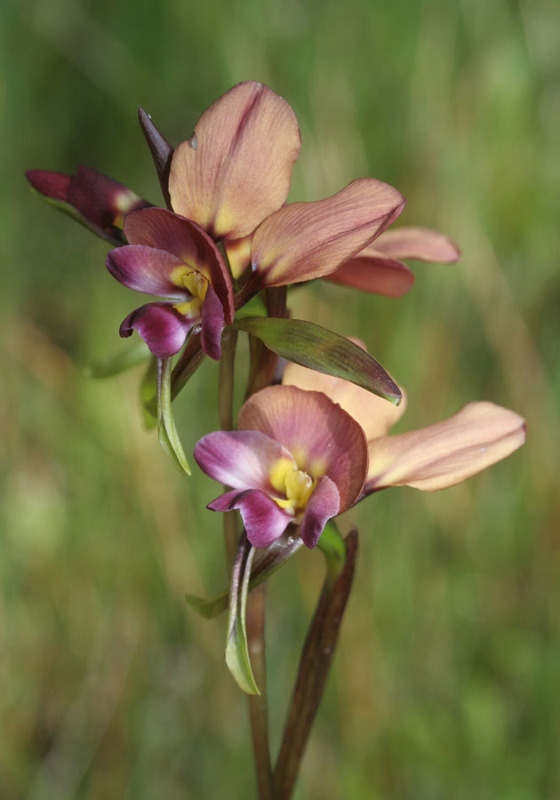 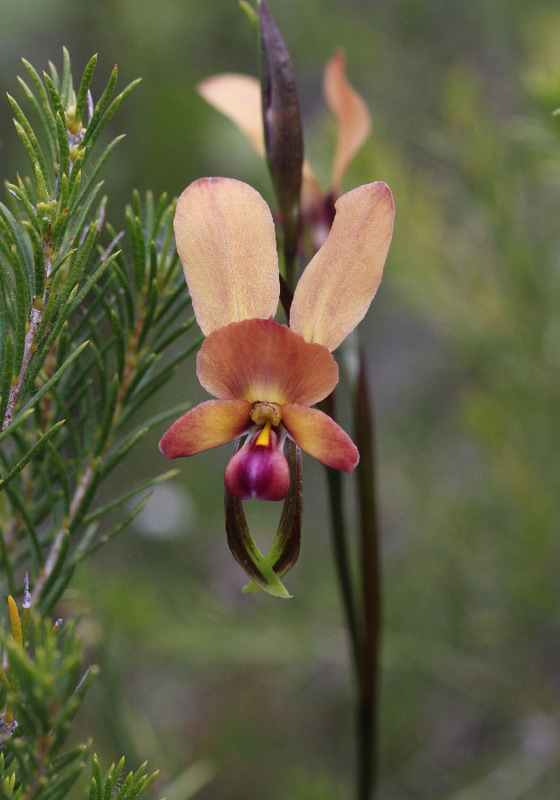 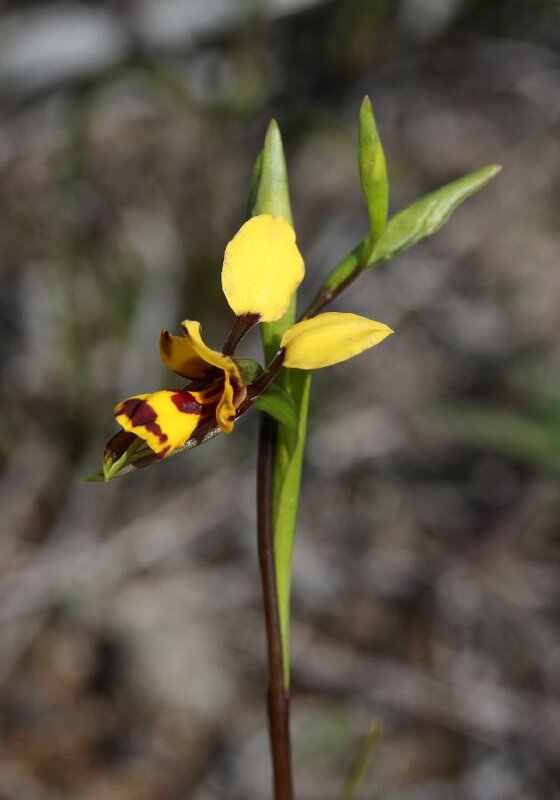 The Bee Orchid is common throughout the Darling Range and western wheatbelt. 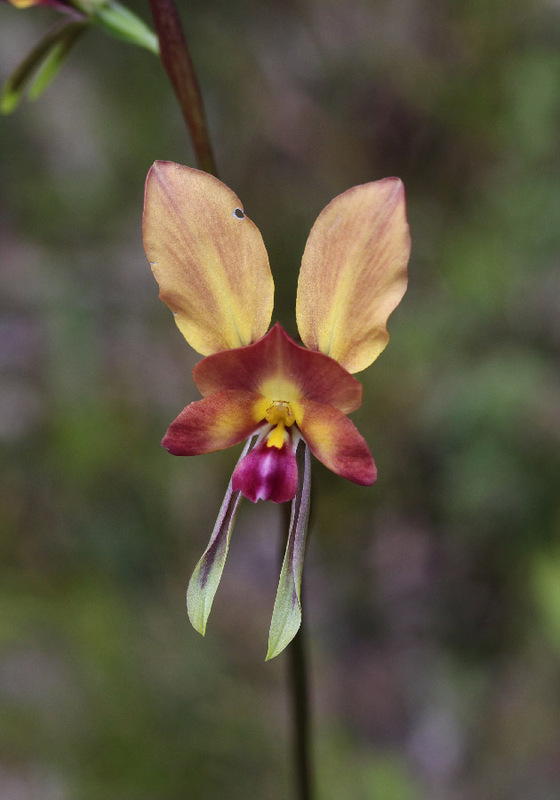 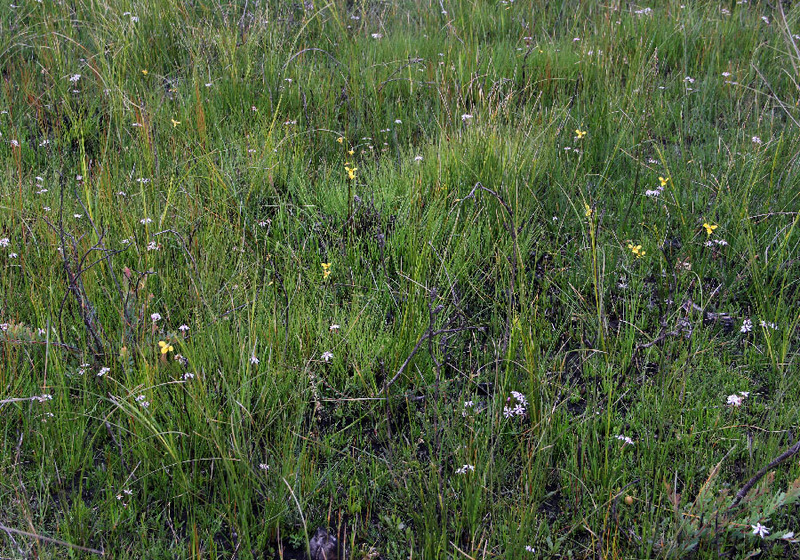 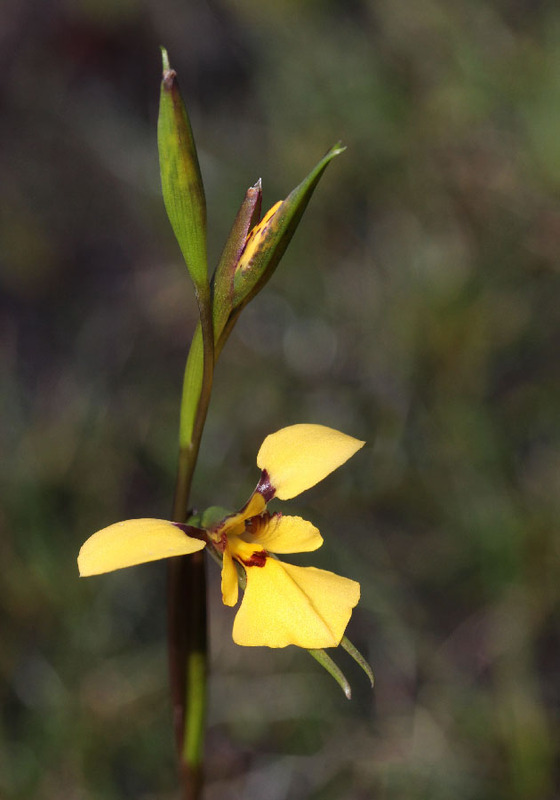 It is a small orchid, about half the size of the Common Donkey Orchid and is usually found in swampy areas. 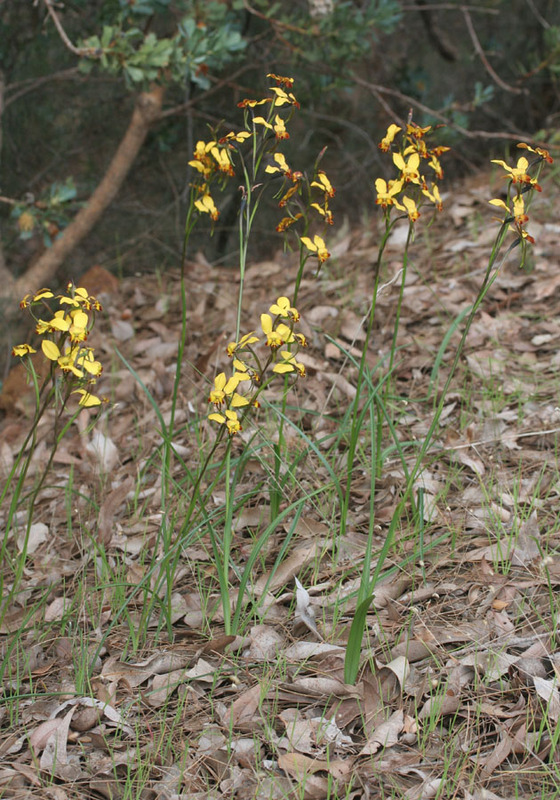 The Tall Donkey Orchid usually only flowers after a summer burn. 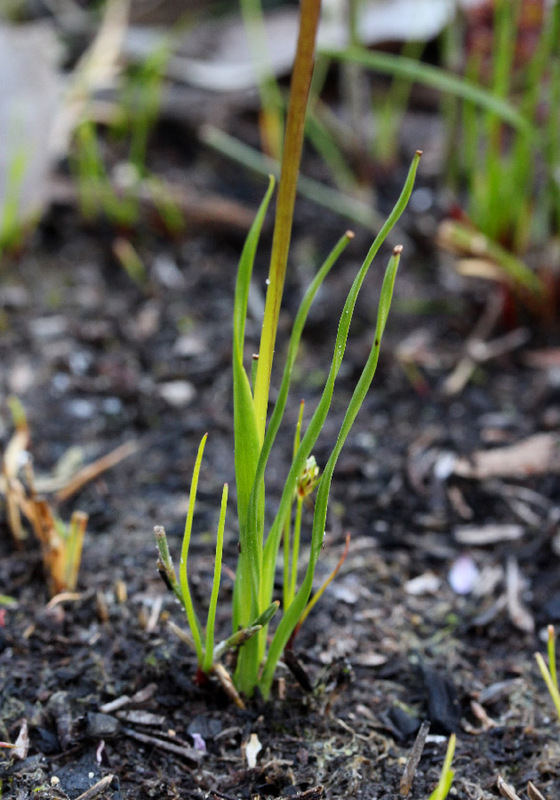 Plants are very tall (hence the name), reaching up to 70cm. 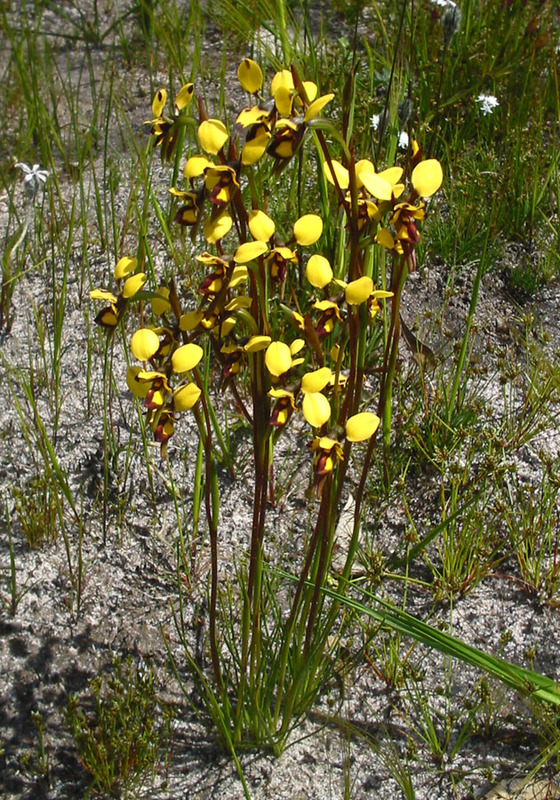 It is a rare species, found in scattered populations between Perth and Albany. 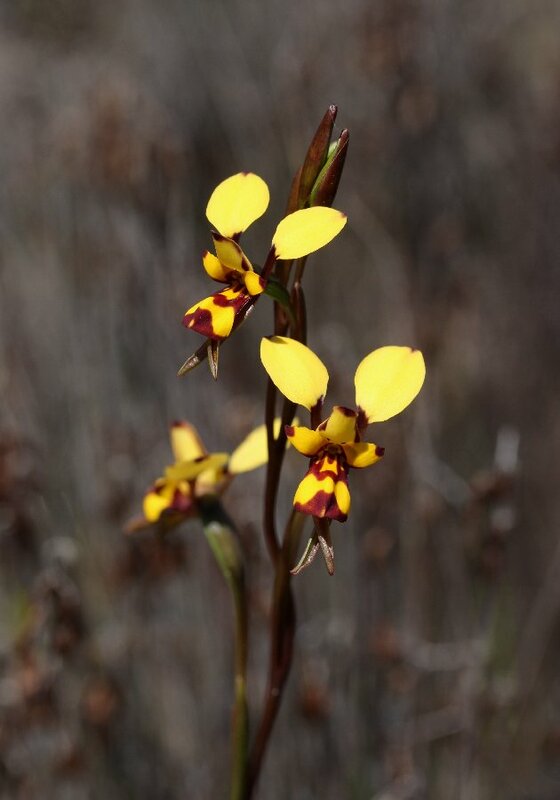 The Swamp Donkey is very similar to the Tall Donkey Orchid, the main difference is much shorter stems and smaller flowers - a "mini Tall Donkey Orchid!" 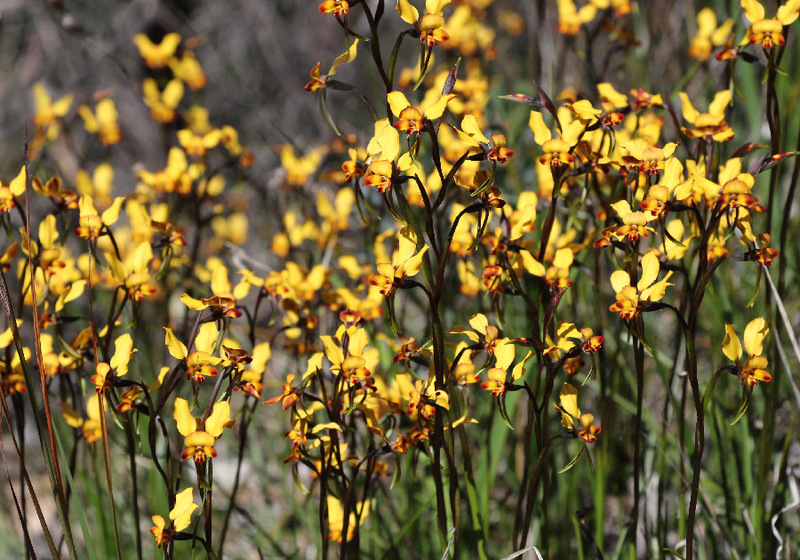 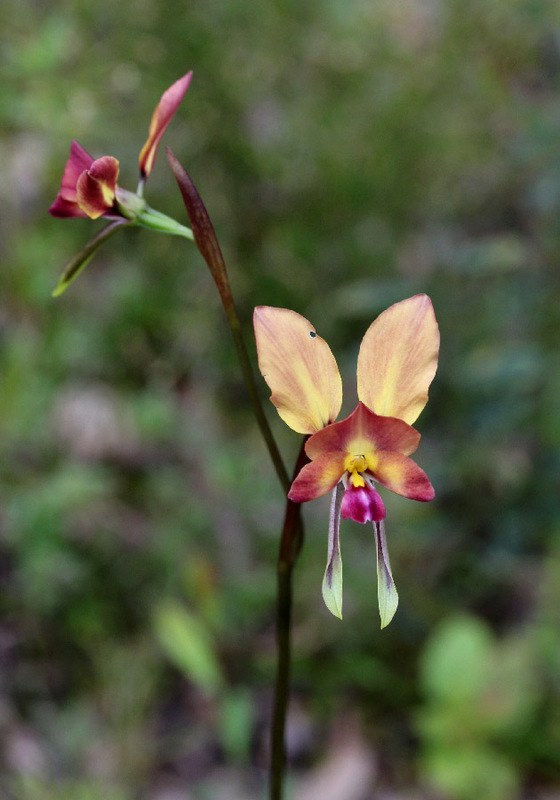 Like the Tall Donkey Orchid, it grows in and around winter wet swamps and flowers only after summer fire. 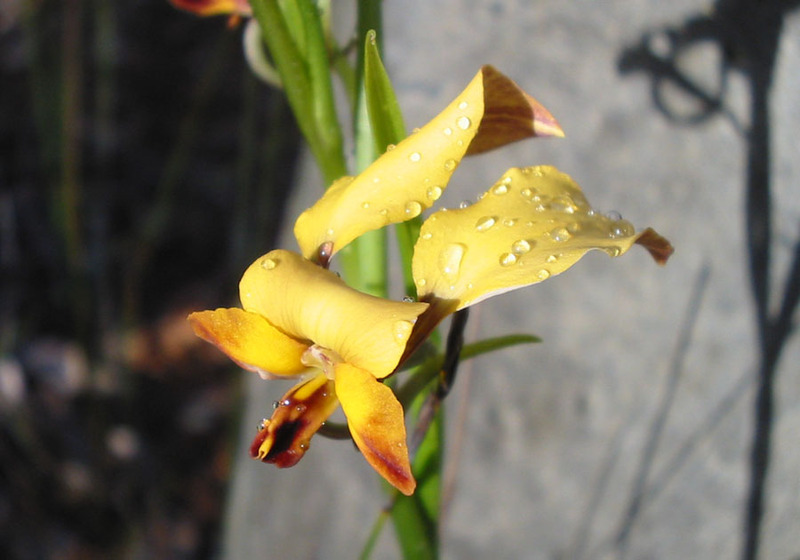 Flowering occurs from November to December. 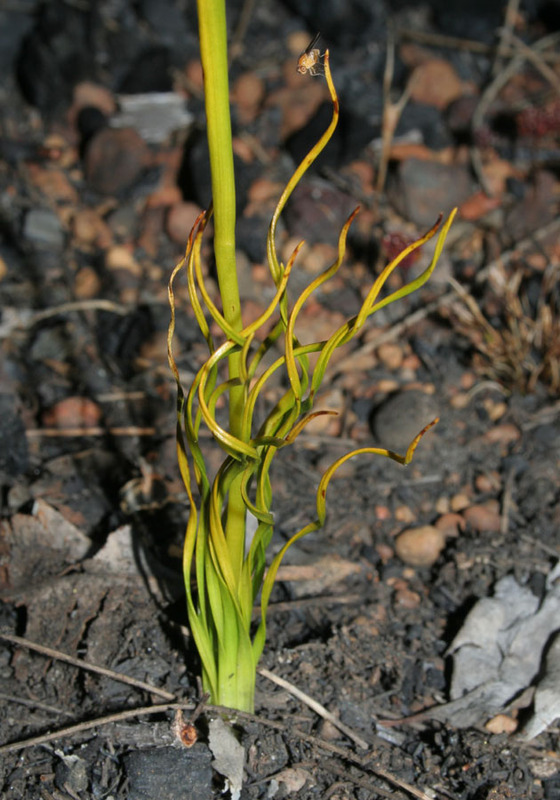 The distinguishing feature of this species is the multiple, thin, spiral leaves. 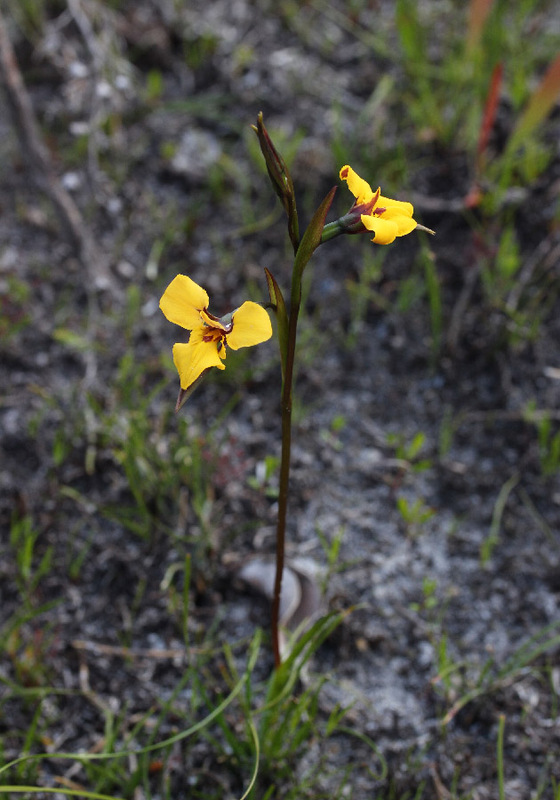 It prefers gravelly soils and is seen at its best after a summer burn. 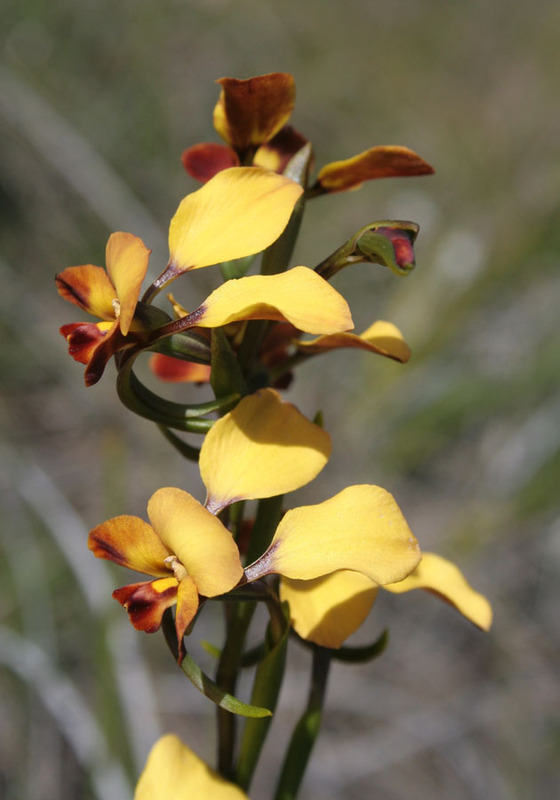 It is widespread from Kalbarri to east of Albany and out to the central wheatbelt. 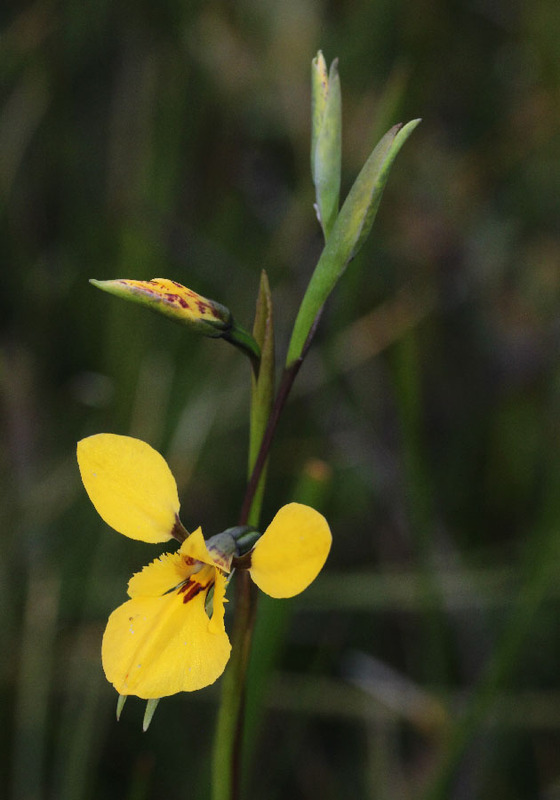 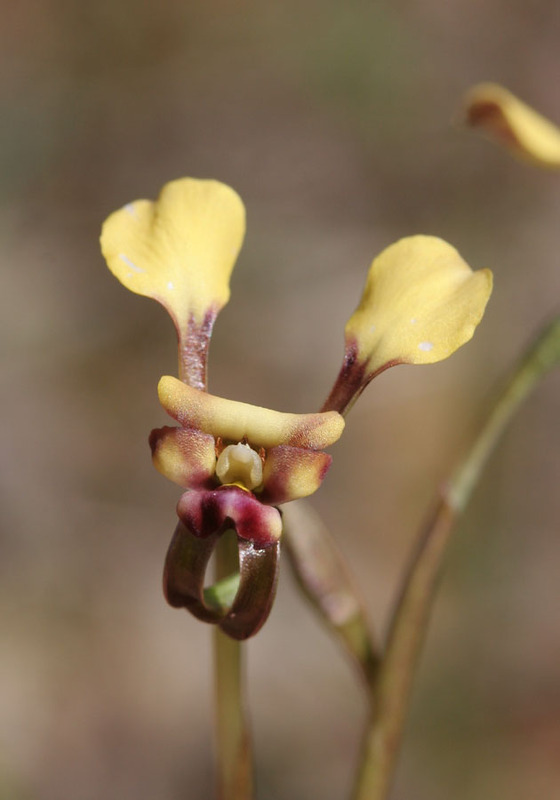 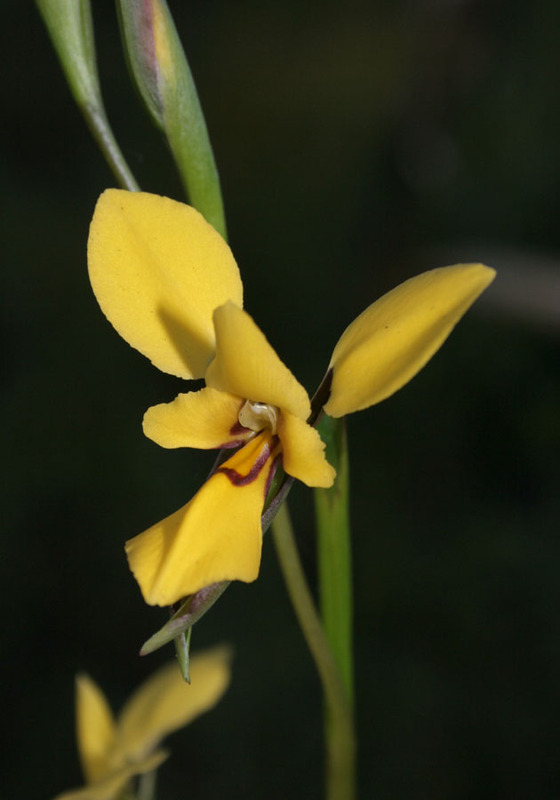 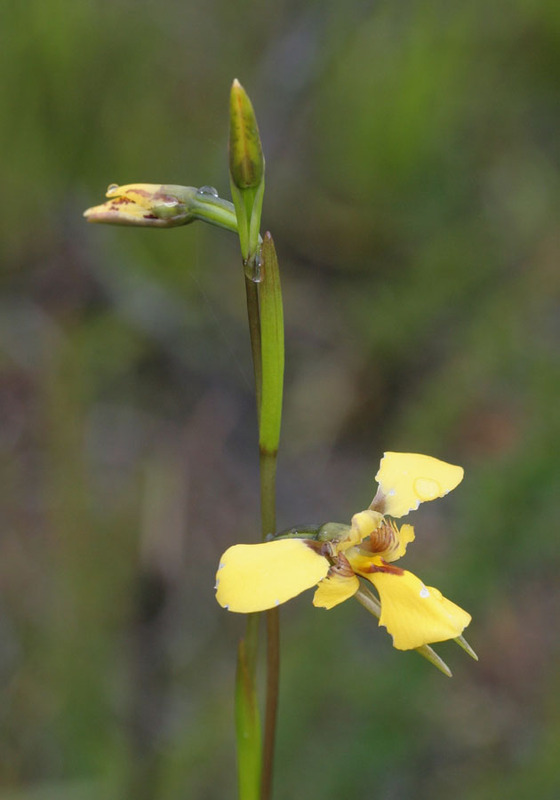 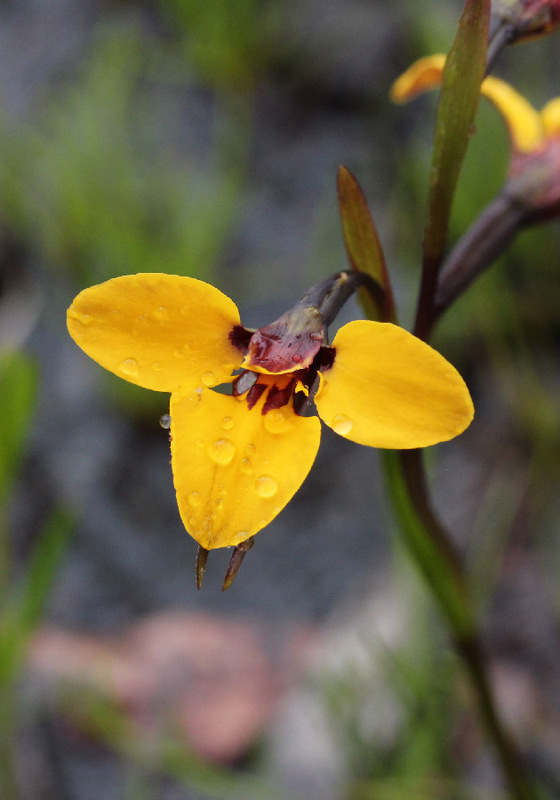 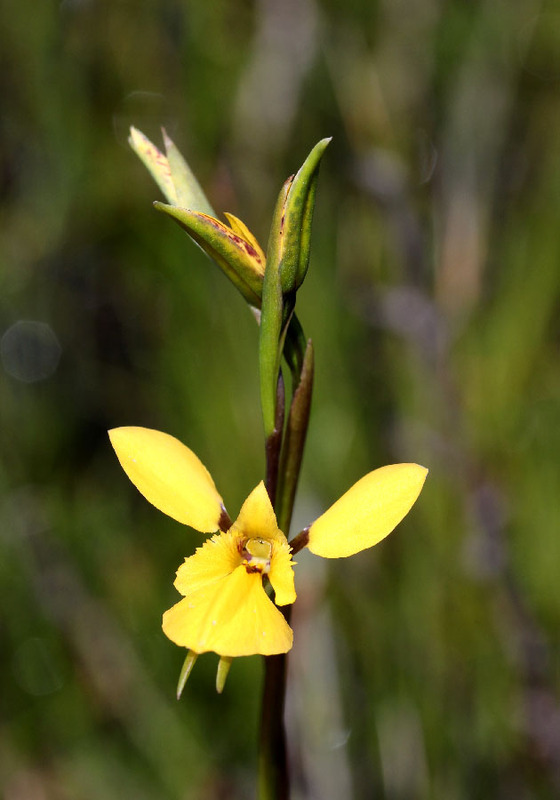 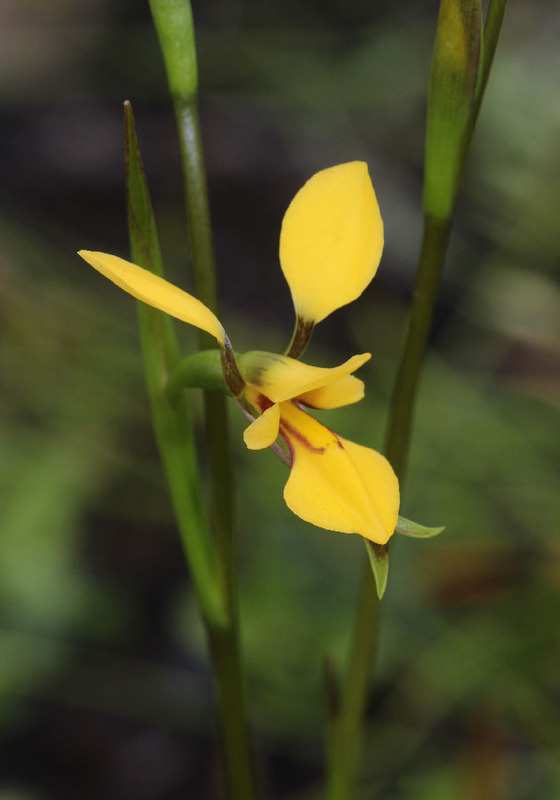 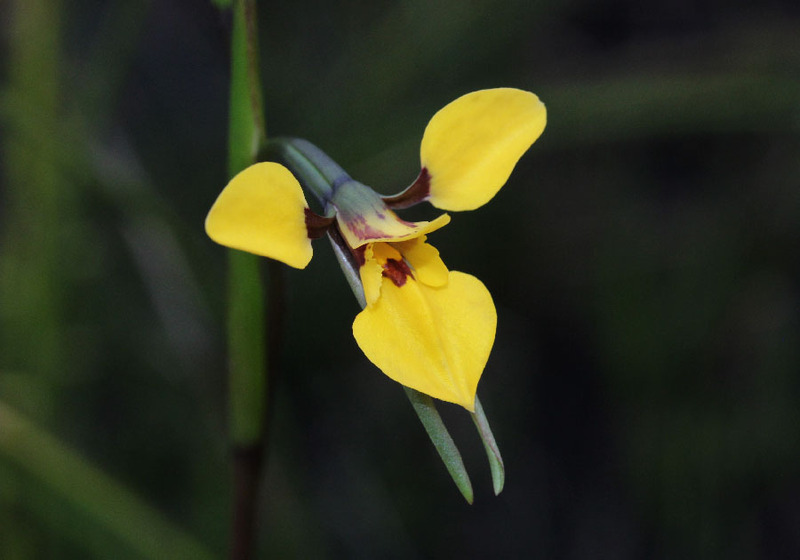 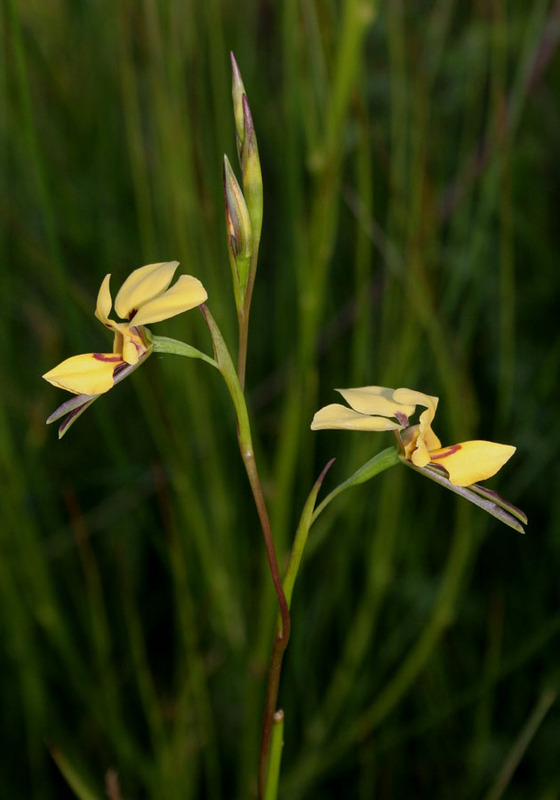 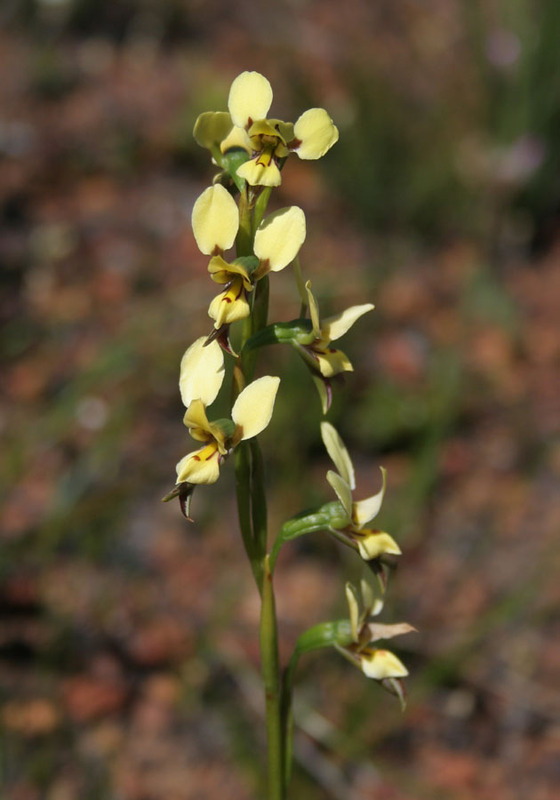 Very similar to the Winter Donkey Orchid, this species is identified by its large, yellow flowers and straight lateral sepals. 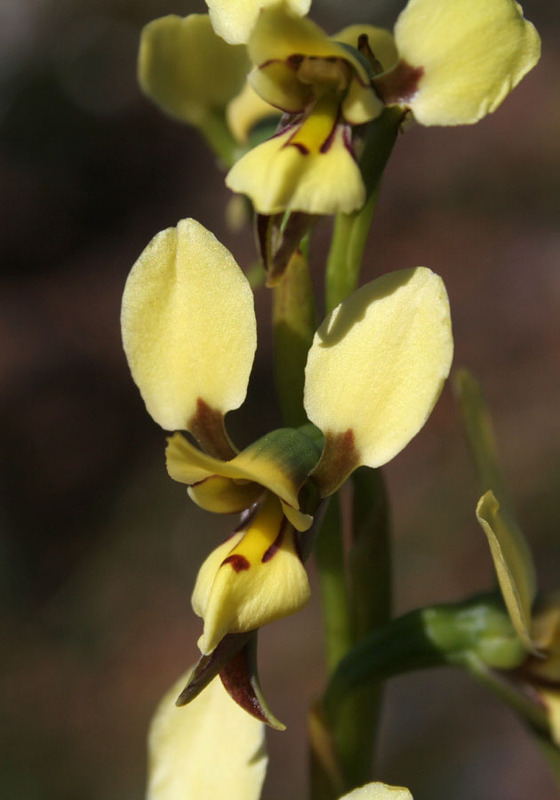 It flowers several weeks after the Winter Donkey Orchid, starting in August. 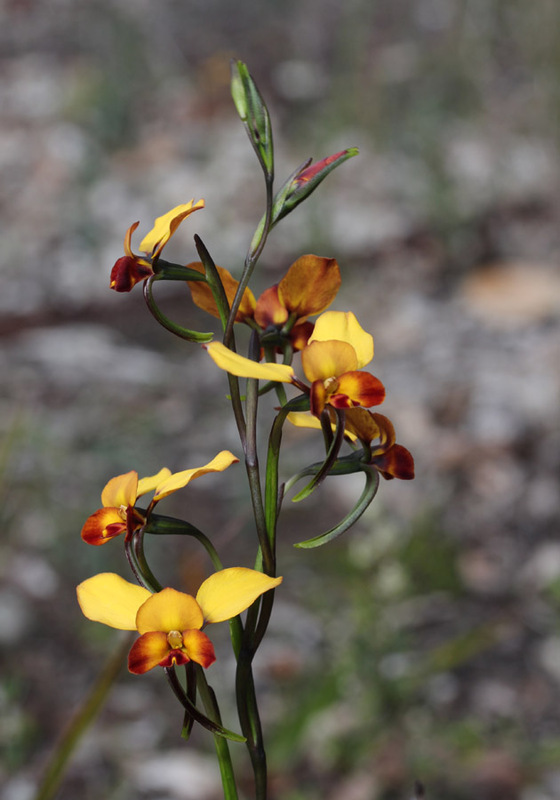 It is found mainly in the Darling Range and out as far as the western edge of the Wheatbelt. 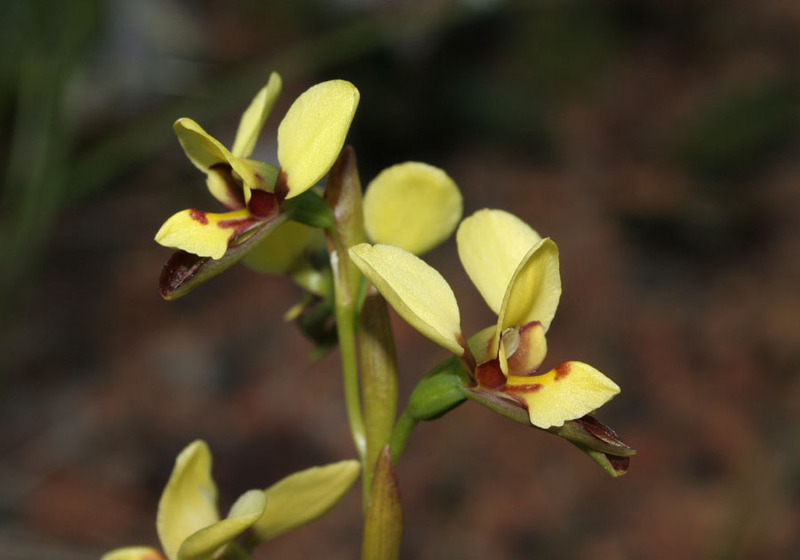 The Mini Donkey Orchid is distinguished by its very small flowers and the strongly recurved sepals. 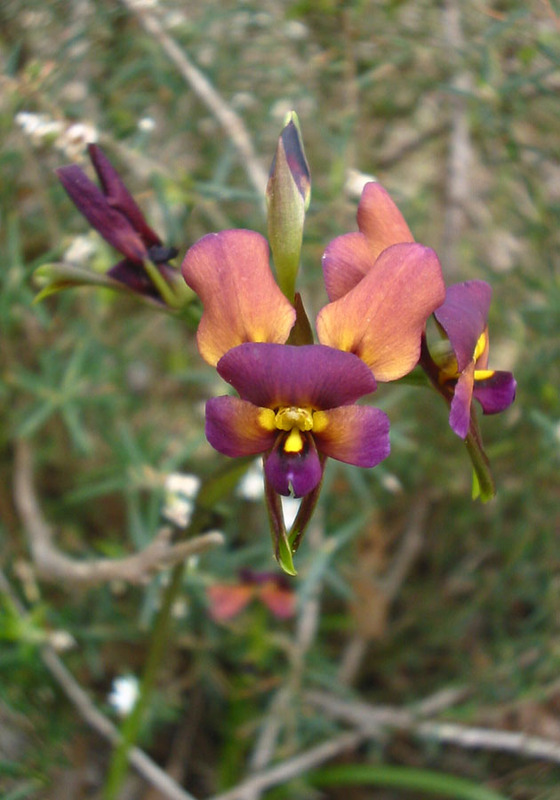 It is found between Perth and Kalbarri. 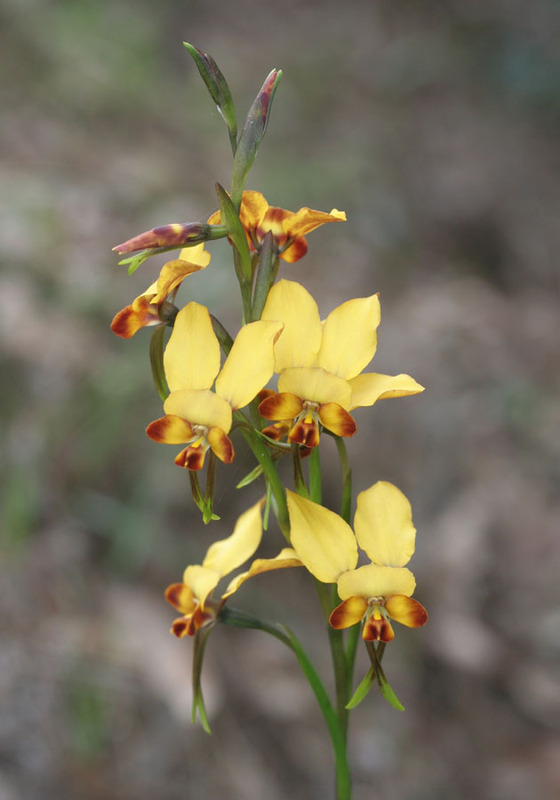 The Nanny Goat is easily identified as it looks significantly different from other donkey orchids. 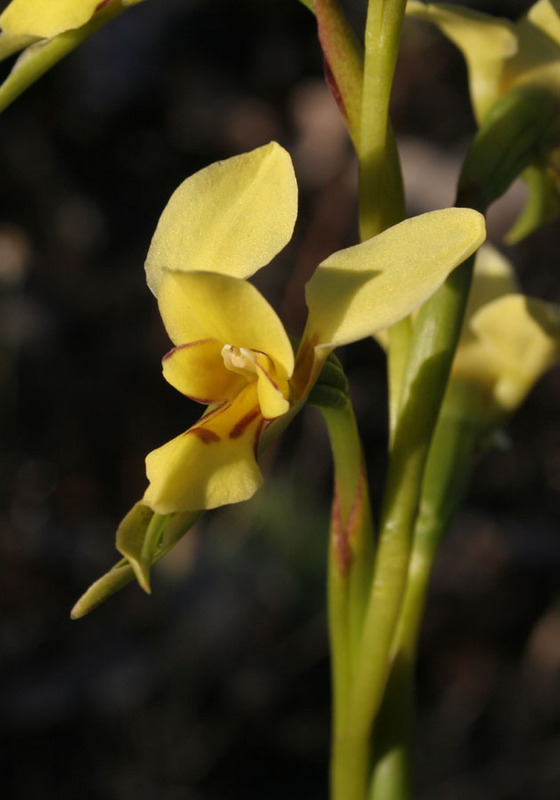 The two 'ears' are held out to each side of the flower and the labellum is rounded and flattened. 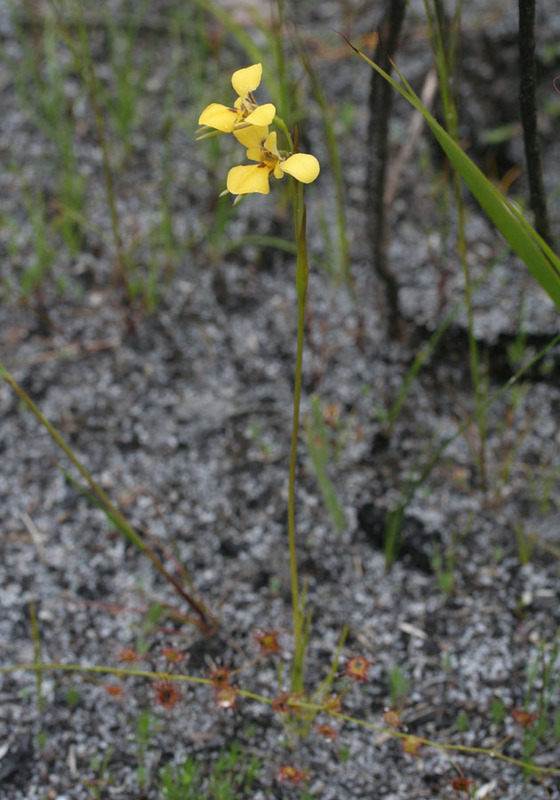 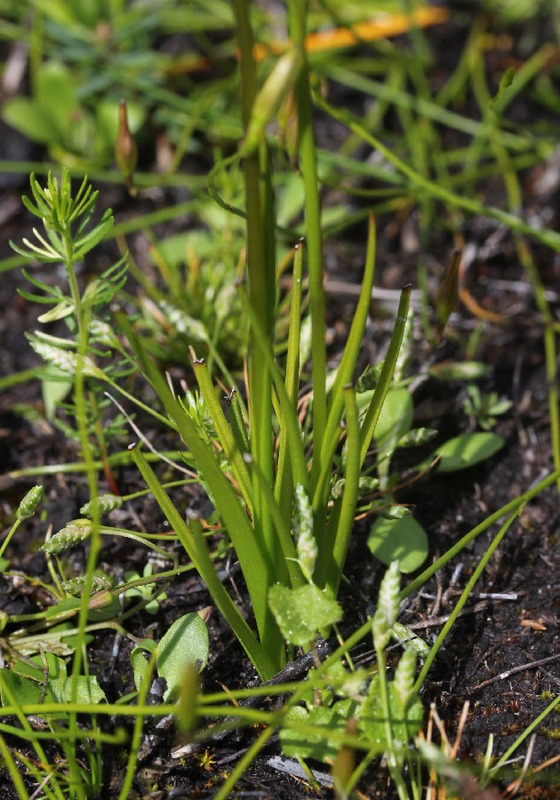 This orchid grows in swamps and only flowers in the season after a summer fire. 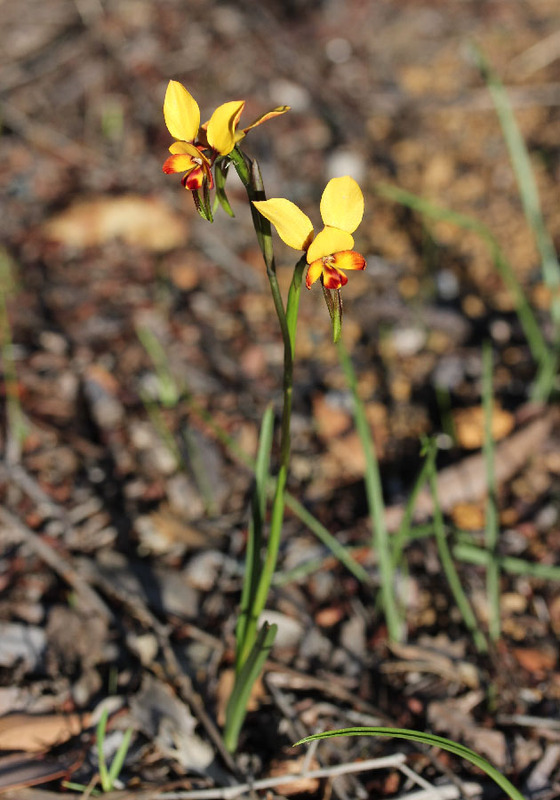 Purdie's Donkey Orchid is a rare species that has similar looking flowers to the more common Nanny Goat Orchid (Diuris laevis). 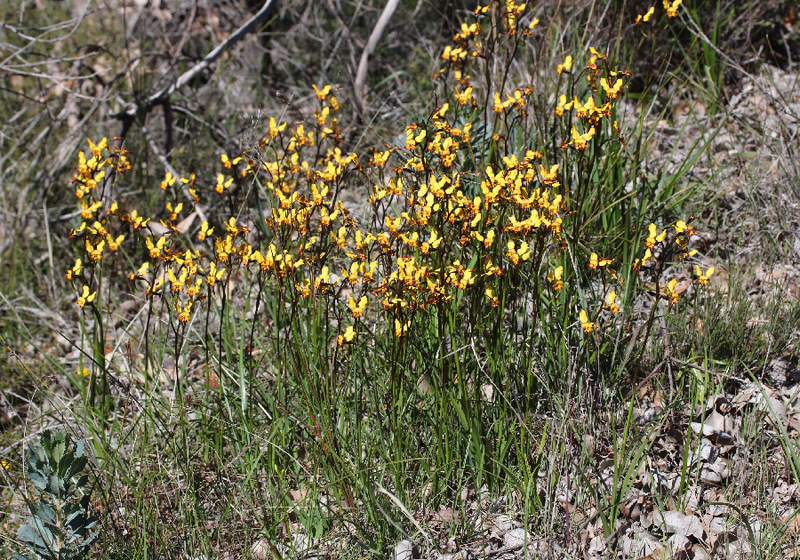 Like that species, it is only found in the season following summer fire (or a late spring control burn). 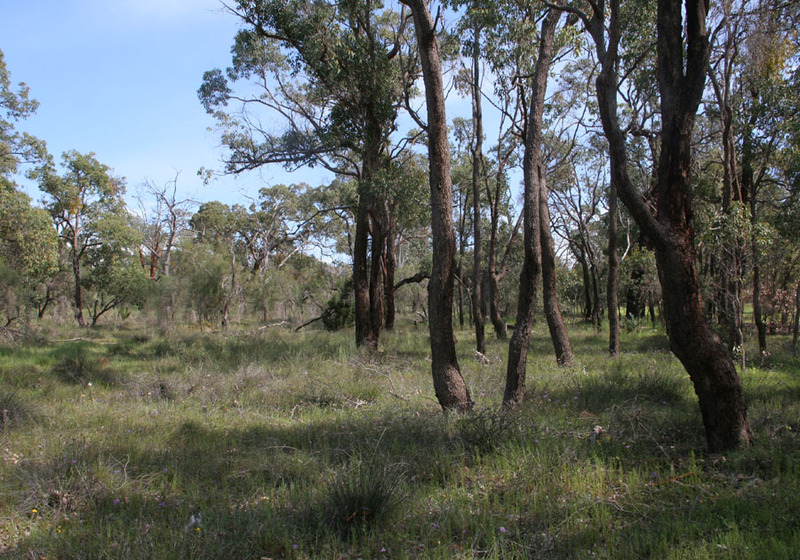 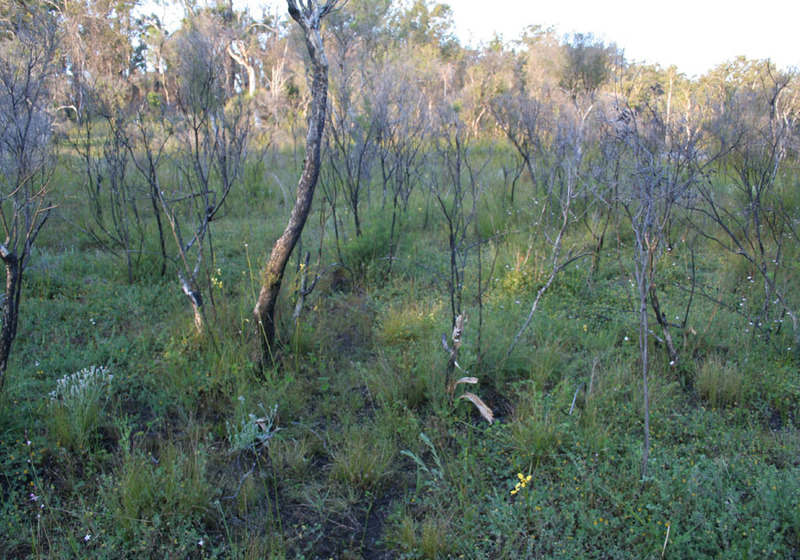 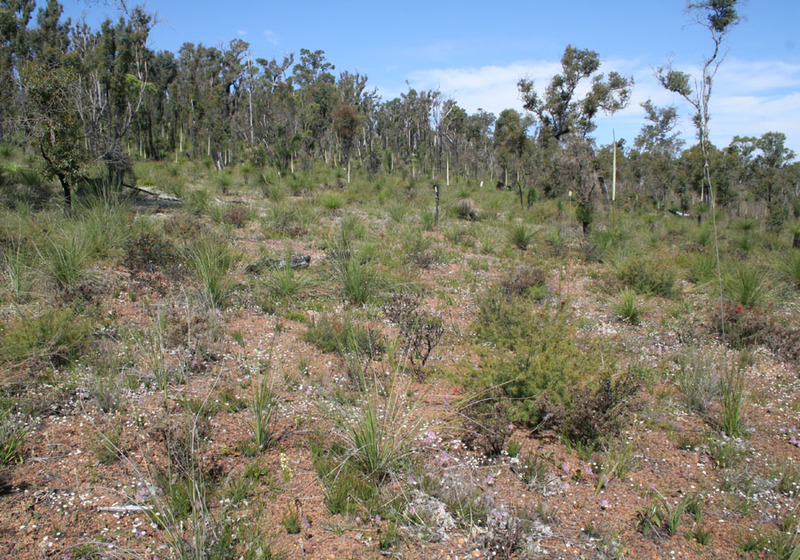 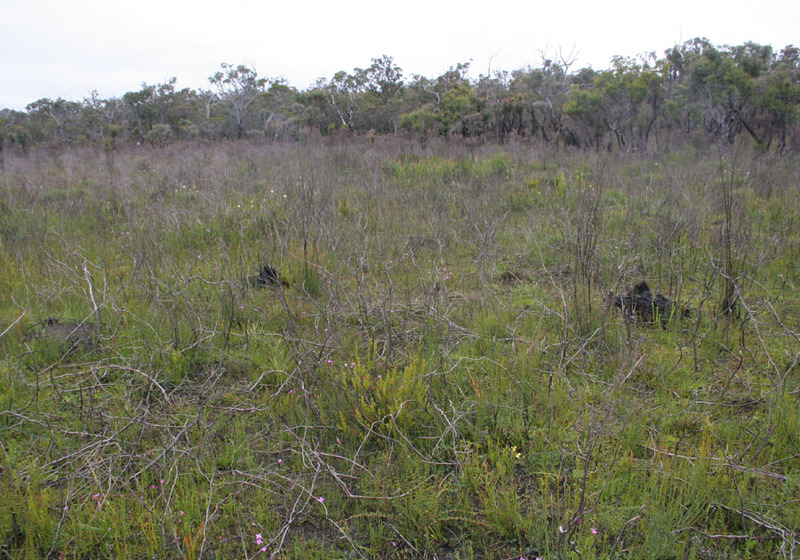 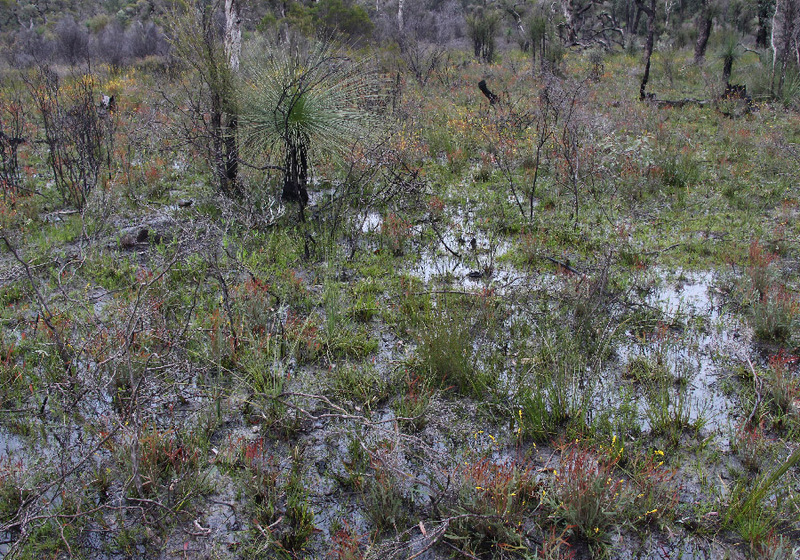 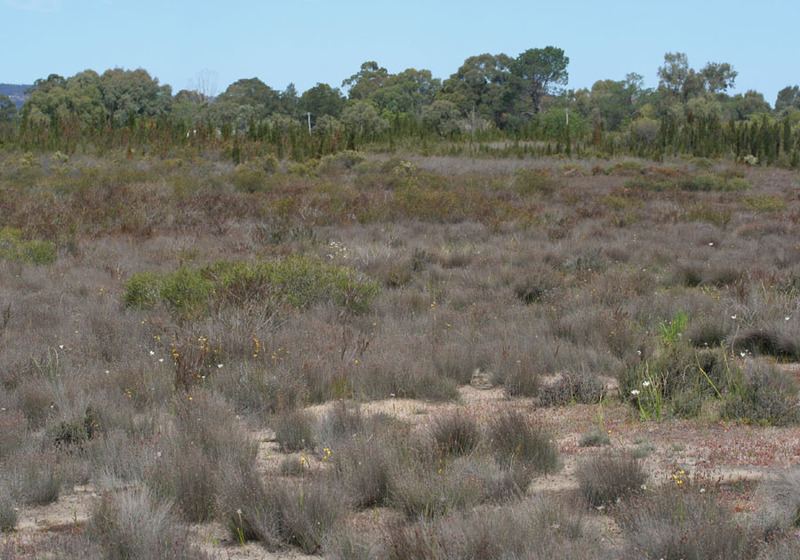 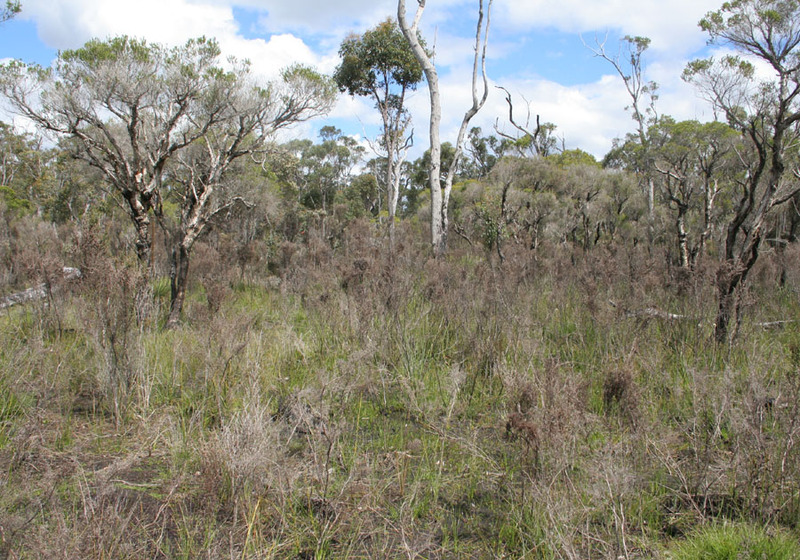 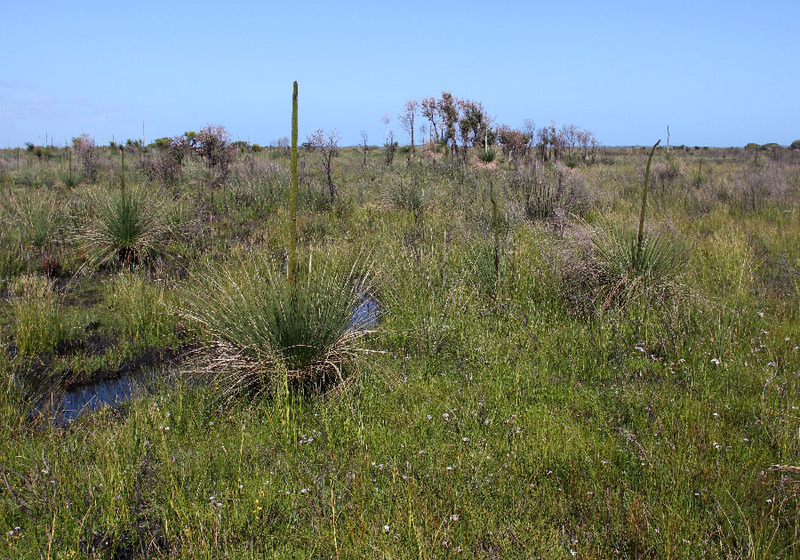 It is found swampy areas mainly on the coastal plain between Perth and Harvey with a few recently discovered populations in swamps in the Perth hills. 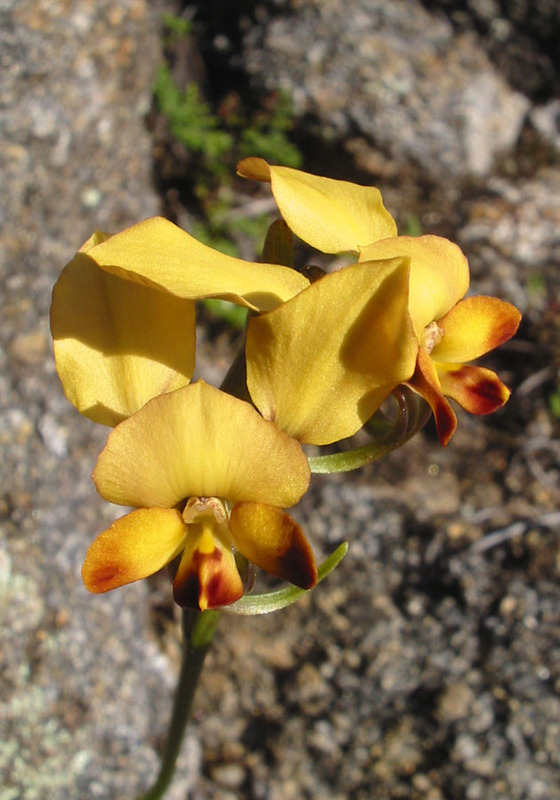 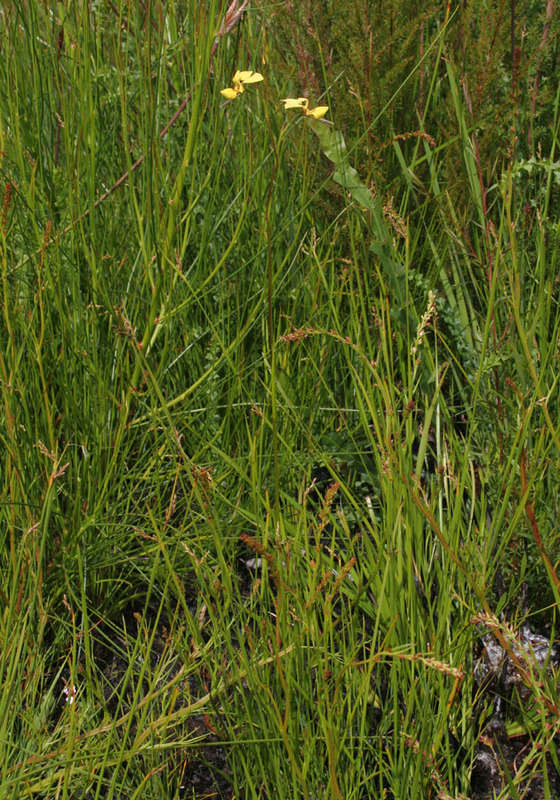 Due to habitat loss, it is listed as Threatened Flora.